This guitar is a prototype for an upcoming workshop. 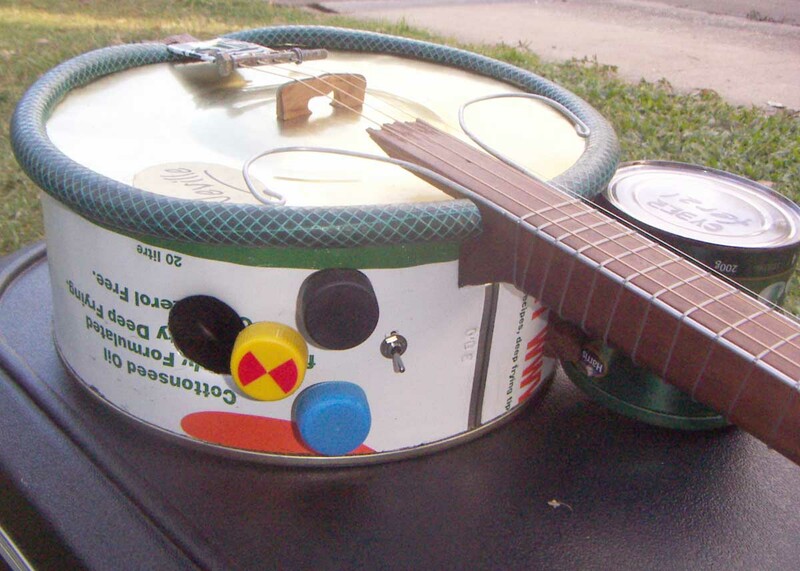 The idea is to make a highly playable electric as quickly and easily as possible. Here we see the elements of the body coming together. 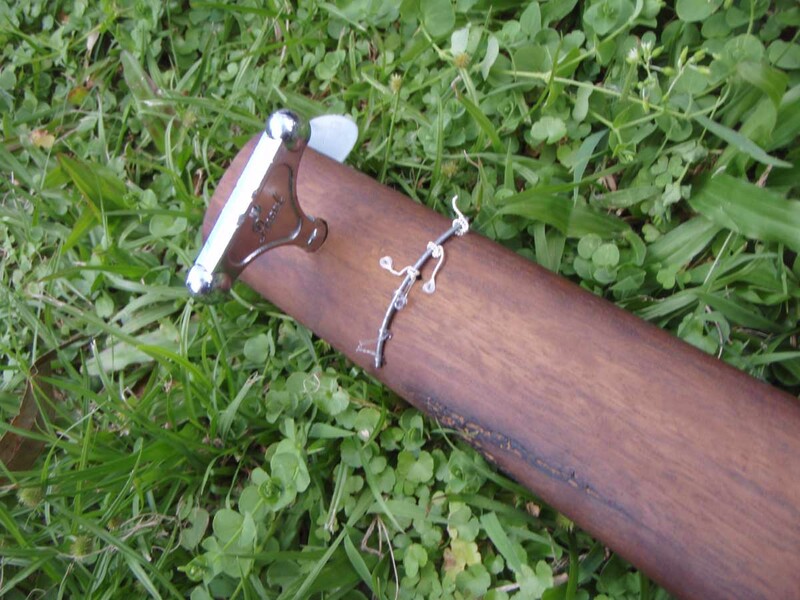 The pine upper arm strengthens the body where the strap button will eventually be. The black tube is a piece of micro-irrigation tube and allows the pickup cable to be slid through the styrafoam body. The output socket is also mounted on a pine block. Here is the foam fitted and shaped. 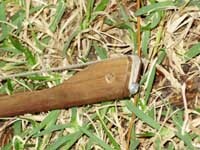 The shaping is done with a box cutter, long bladed craft knife to start and coarse sand paper to finish. The pickup is wired directly to the output socket without knobs since many players rarely use the controls on the guitar anyway. The body can be finished in a number of ways from fibreglass, like a surfboard, to wrapped textile, like a "coolite" hard case. The frets are fitted in the standard Uncle Bob way and go all the way 'round the one piece neck. 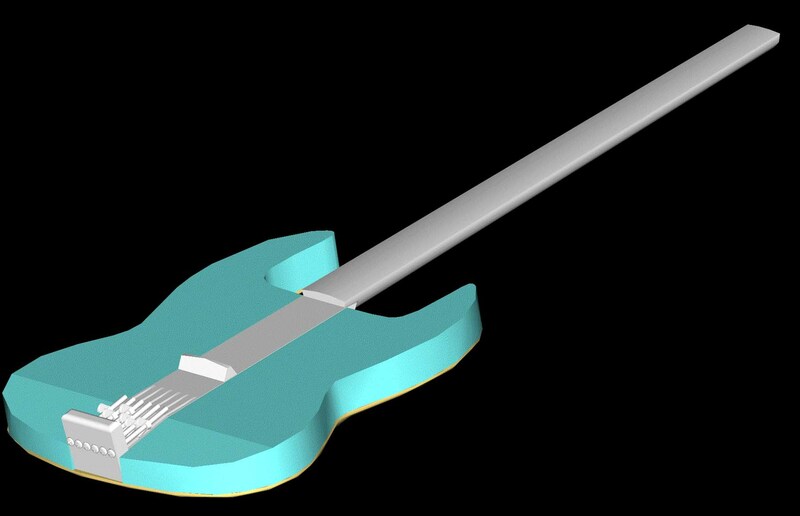 I've fully "CAD'd" the guitar so full scale and dimensioned drawings are available for all parts of the guitar. If you'd like to have a go at building one, let me know what you need and I'll produce them for you (no charge unless you're rich). 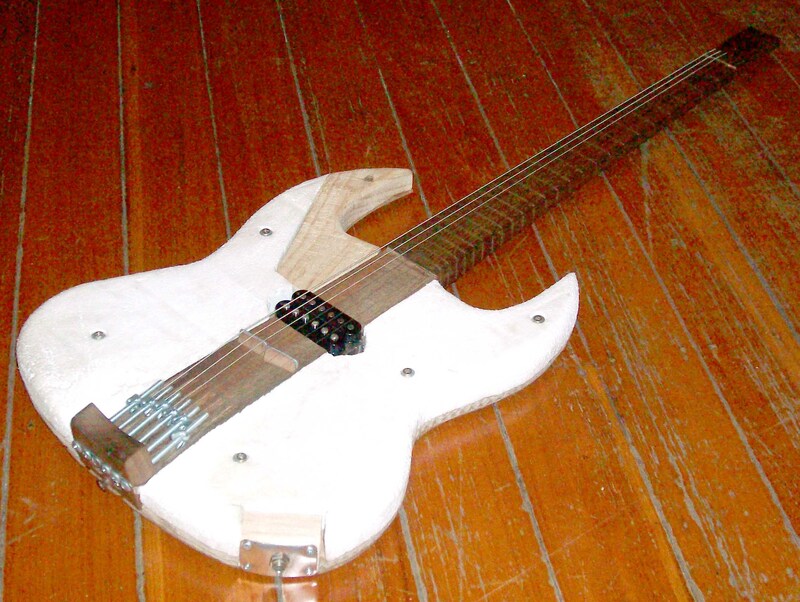 I feel this guitar would make an excellent shop project in High Schools, let me know if you can help make this happen. What's it sound like? It sounds like every other solid body humbucker fitted guitar. Couldn't be anything else. 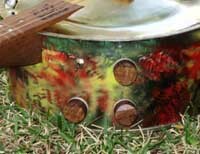 This is the first private commission instrument in the USA. 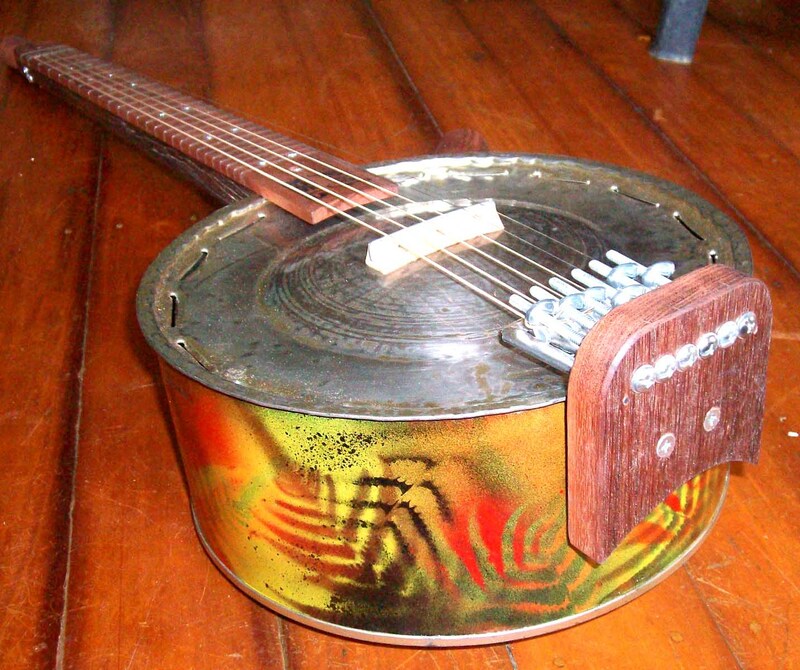 It's owned by Keni Lee Burgess, a collector and musician in New Jersey. It's an acoustic full size six string. The construction is what I'm refering to as Uncle Bob standard with an additional leg arm. This shows how the leg arm is attached inside the body. 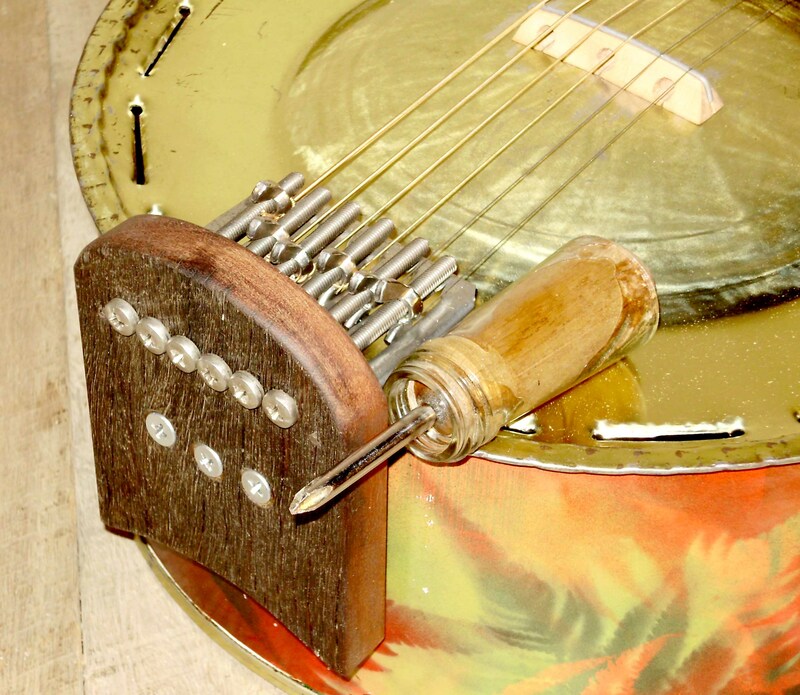 The tuner driver is a standard (read cheap) phillips head screw driver slightly modified to perfectly fit the tuner bolts and fitted with a hand made wooden handle made of the same timber as the rest of the guitar. 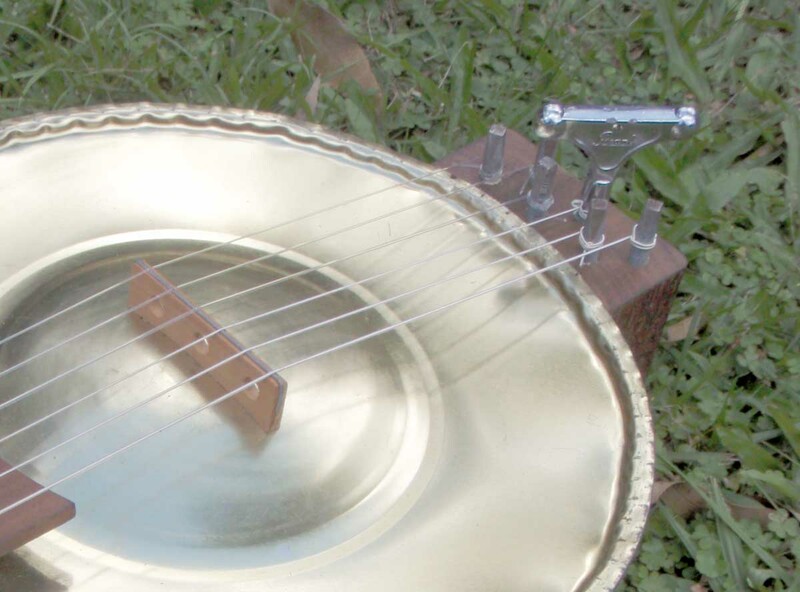 This guitar also features a wire at the bottom of the string holes to prevent the strings being pulled through the grain of the wood and improving the longevity of the instrument. Since Keni Lee wanted a wider string spacing than normal (8mm at the nut instead of 7mm) I've also added support screws to the edge of the head to prevent splitting and to provide a tactile clue to the end of the fret board, useful for feeling where you are without having to look. The body features my now standard Black, Red and Yellow fern motif and straight bridge since Keni Lee uses a variety of tunings. Here is a video by Keni Lee playing his new guitar. 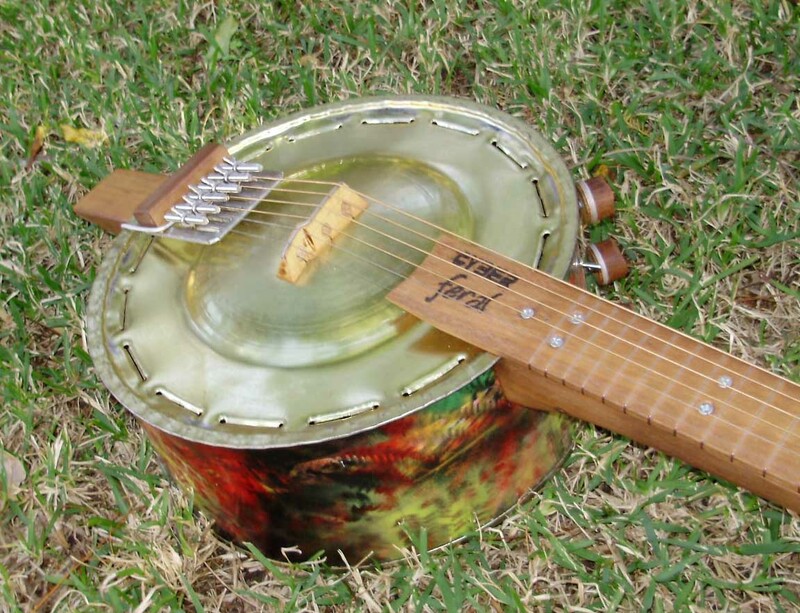 This is probably best described as a banjo dulcimer. 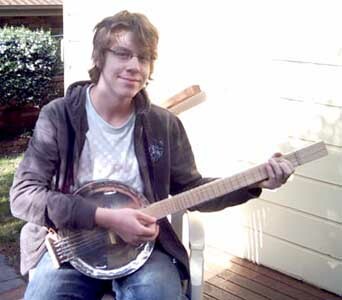 It has 3 strings tuned DAD. 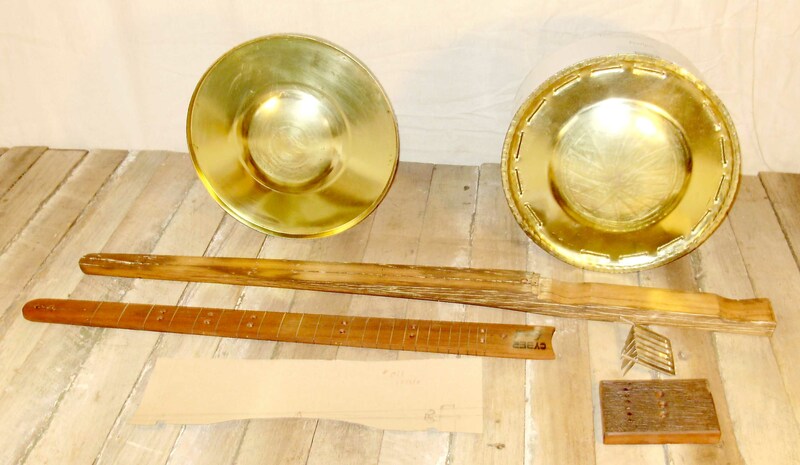 The recording below and all the photos show the instrument with steel strings; the thinnest three strings from a standard electric set; sizes 10, 13 and 16. At the pitch they're tuned to, the strings have quite high tension; a little more than they would have on an electric. 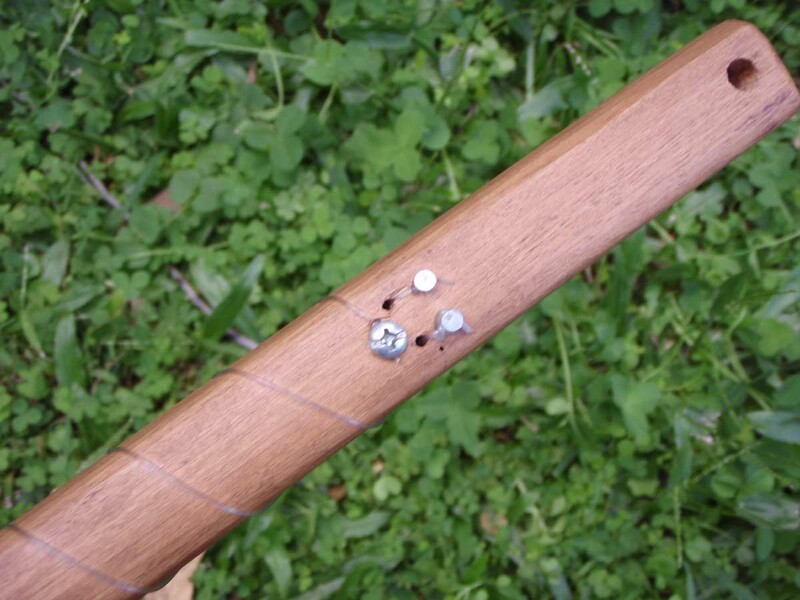 The zither pin tuners are a little fiddly to use but hold their tune quite well. 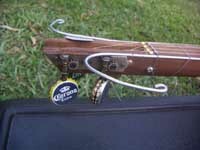 It's about as tough to tune as a violin without fine tuners. Click on the image for a closer look. 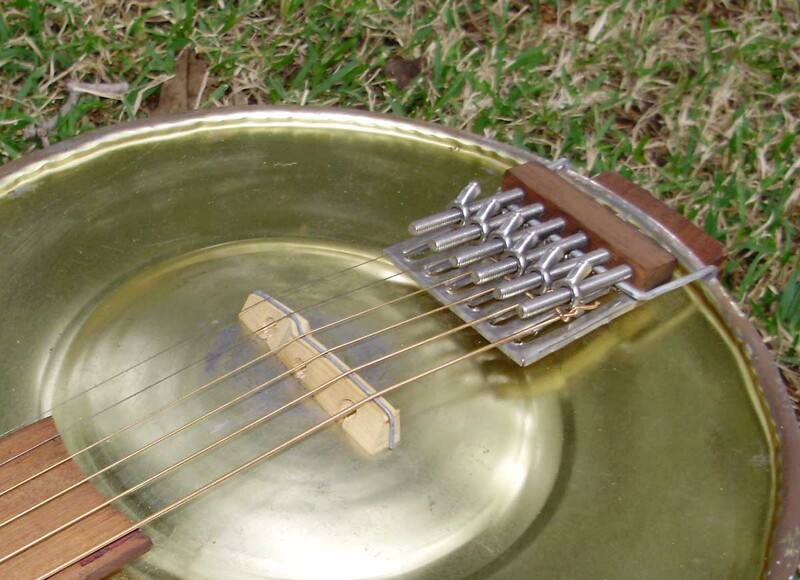 This pic shows the tailpiece which is specially constructed to maintain a very low break angle across the bridge; the strings are very nearly dead straight. This is required because the "cookie" tin that the instrument is made from uses a very light steel sheet. 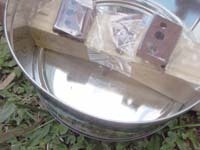 You can actually mark the tin quite easily with your thumbnail. With the high tension in the strings it is necessary to use a low break angle on the bridge to minimize the downward pressure on the bridge. 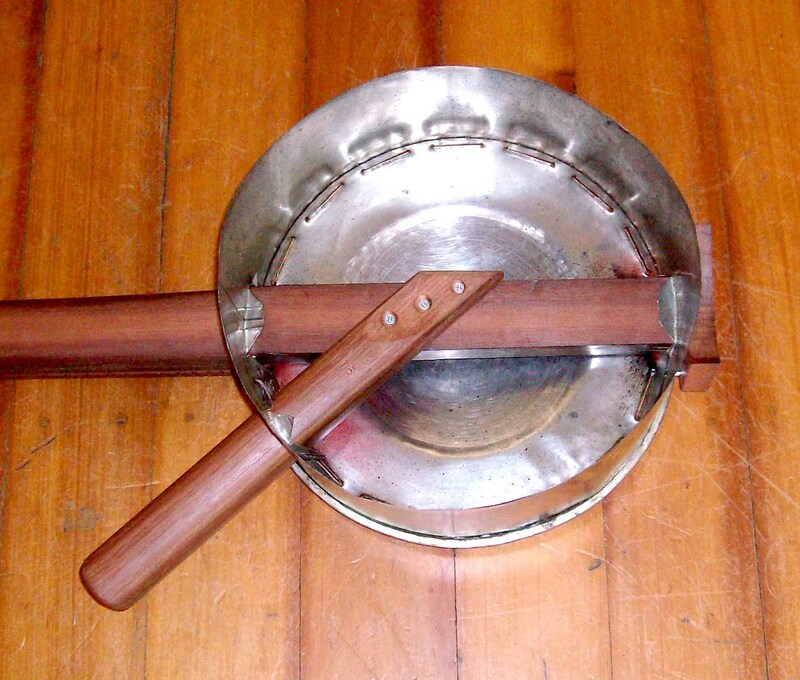 A standard break angle would cause the bridge to sink into the body. Tone doesn't seem to be adversely effected though. 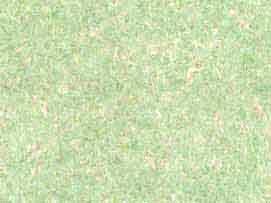 In this pic you can also see the edge of the fret board which is a piece of kitchen-bench type laminate. 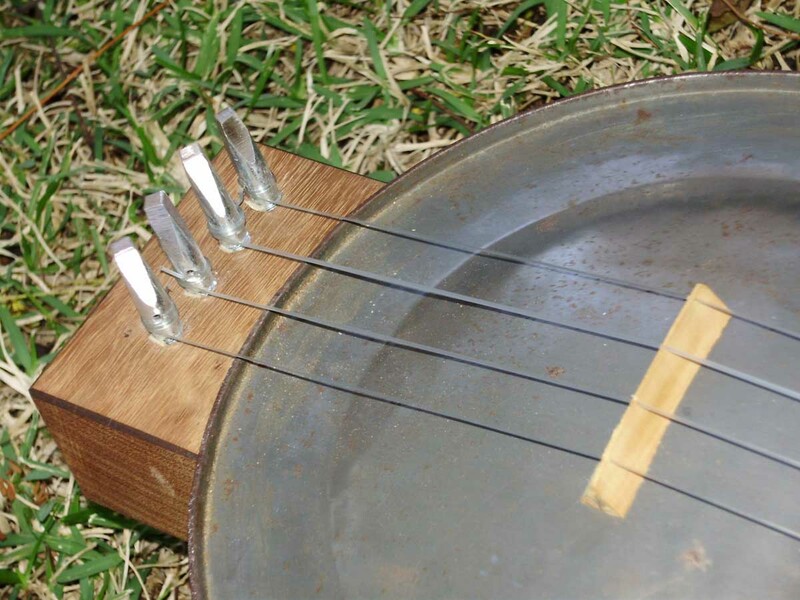 The fret board is used here to position the frets as the dulcimer fretting makes for some pretty extreme changes in angle at the edge of the neck which would be tough for the wood to hold onto without the added hardness of the laminate. 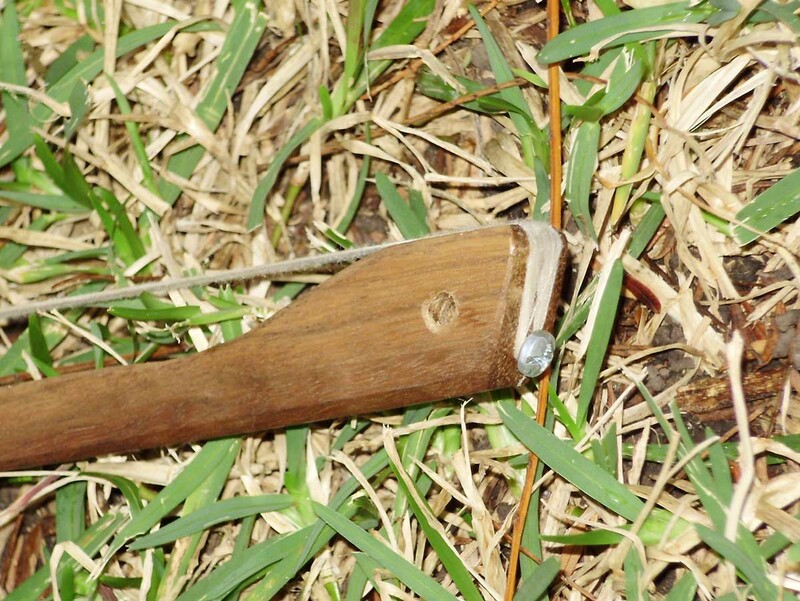 Here you can see the bridge is simply a small piece of pine with a wire resting on top. Due to the difficulty in getting a good fit between the bridge and the sound board, I've used BluTac as a gasket under the bridge. 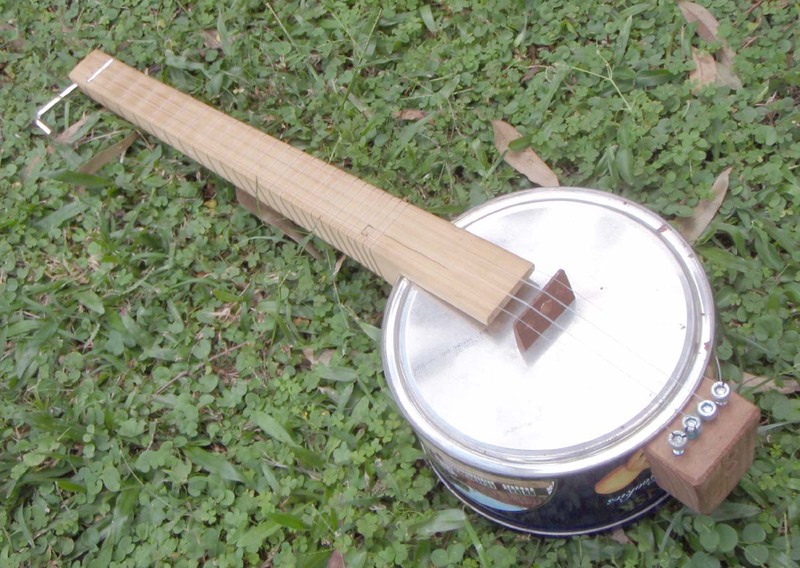 Due to the particular nature of BluTac, the sound is actually improved by this application. 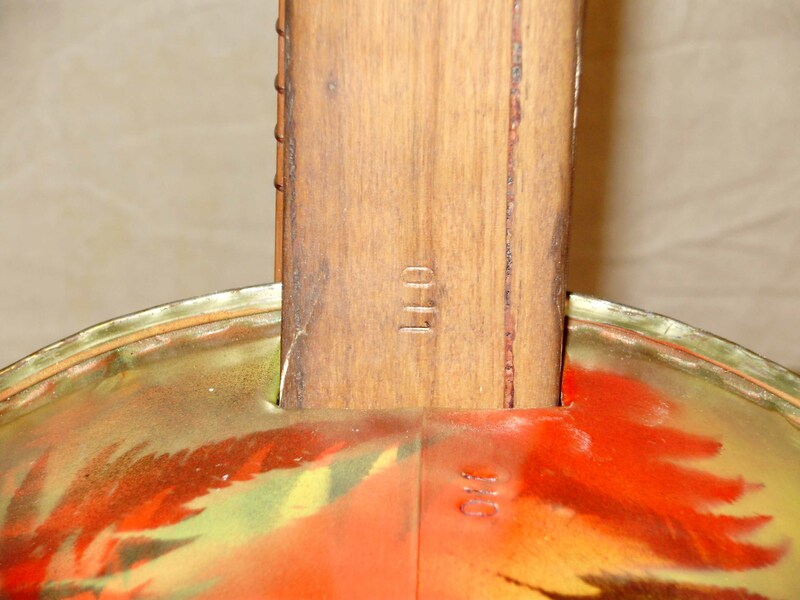 The back of the neck shows nails which are used to terminate the frets and nylon strings. The long nail allows it to hang on the picture rail on my lounge room wall. Here is the inside showing the small sound hole and the simple design. 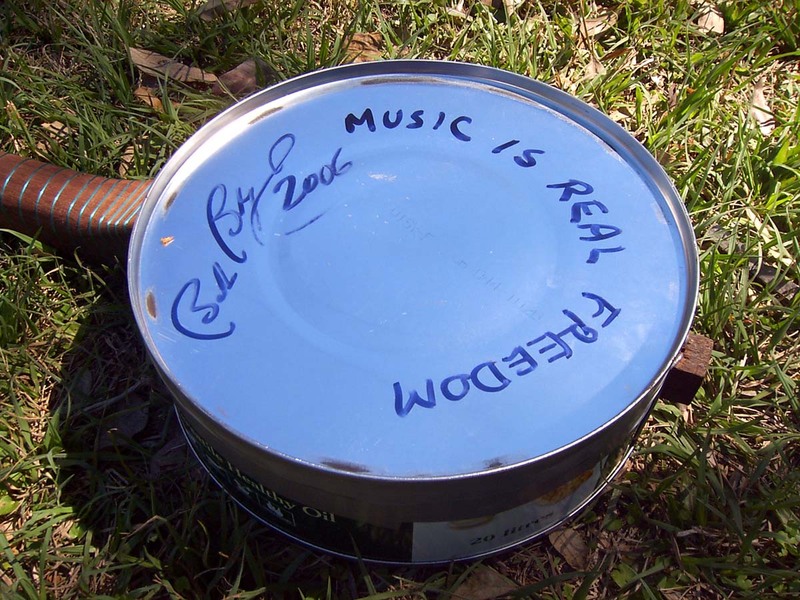 This is the first totally authentic Uncle Bob made outside of the CyberFeral workshops. It's been made by Julian, a 15 year old student in Victoria, Australia. It's a fantastic first effort and Julian already has plans push the boundaries with a 12 string version. This is what I've been working towards. 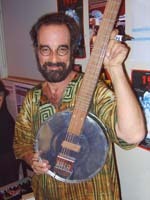 A guitar for Bob Brozman. I presented it to him at the Guitar Brother's sponsored masterclass in Brisbane on 1 October 2008. We were both very happy with it. Here it is in pieces, remember you can click through on all of these images to see high res versions. 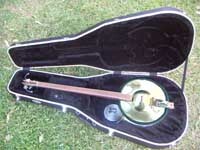 The body showing the radial perferation sound holes which favour projecting music out to the microphone rather than up to the musician's ear. 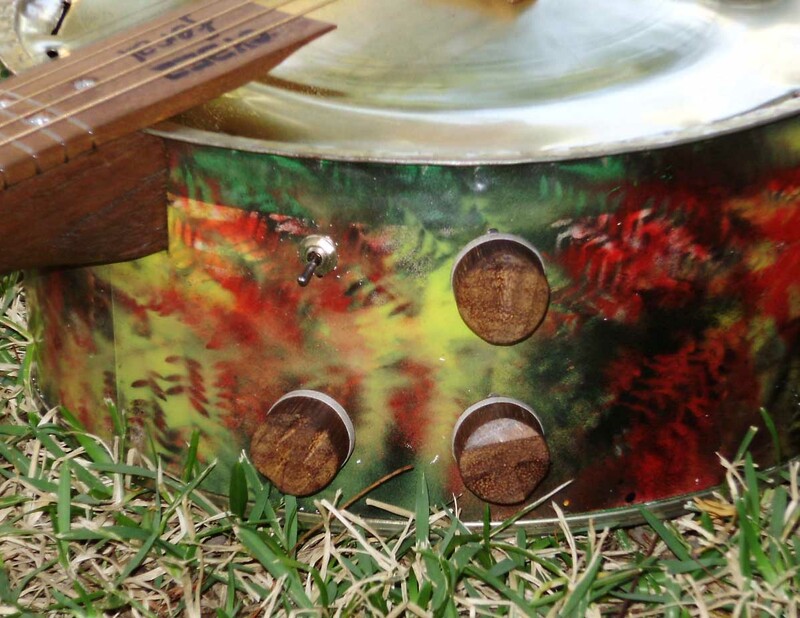 The paint job is done using ferns which grow outside my workshop as stencils. The dome is entirely hand burnished, no electricity at all. 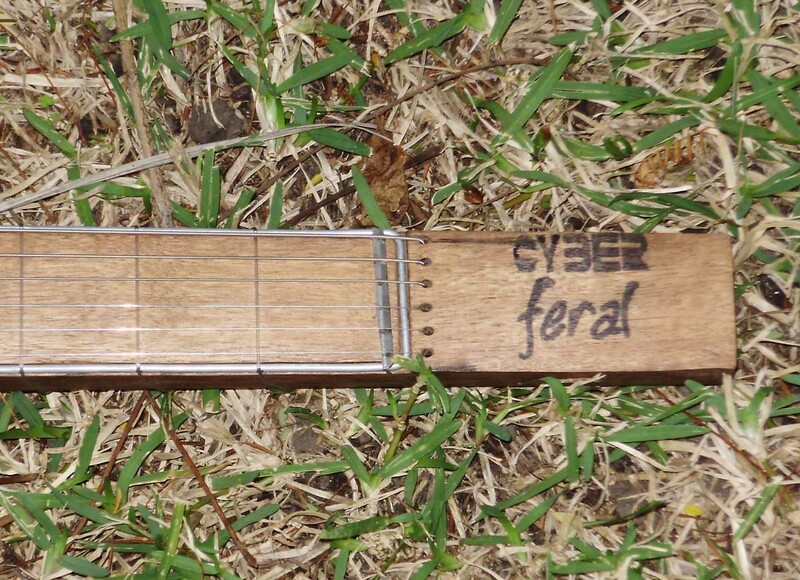 Here is the back of the fret board showing the wrapping of the frets (click through) which are 100 pound fishing line secured at each end with a screw. 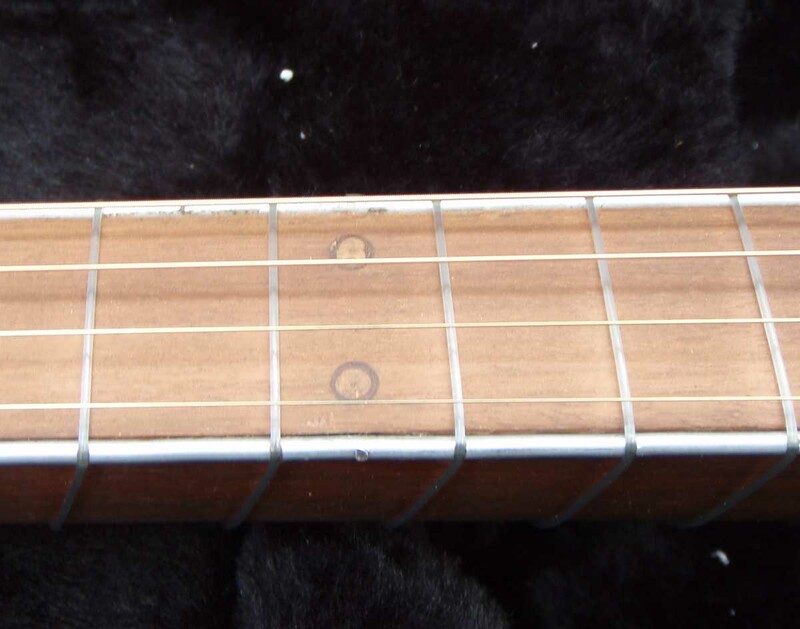 The screw holes correspond to standard fret position markers. 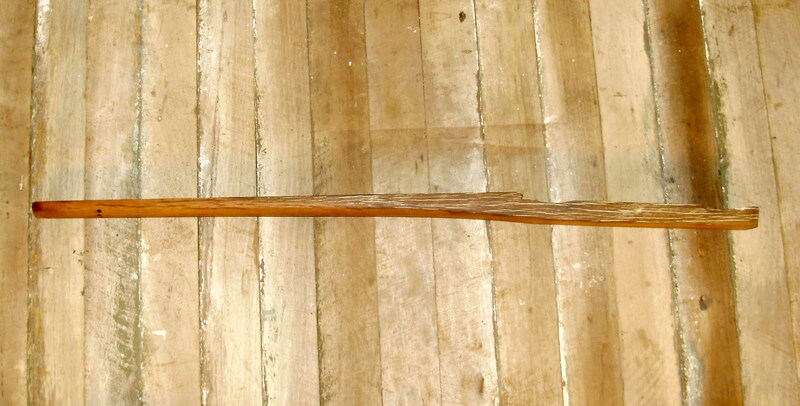 The back of the neck showing the smooth lines and the string ball ends. The hole is for the tuner/bottleneck. 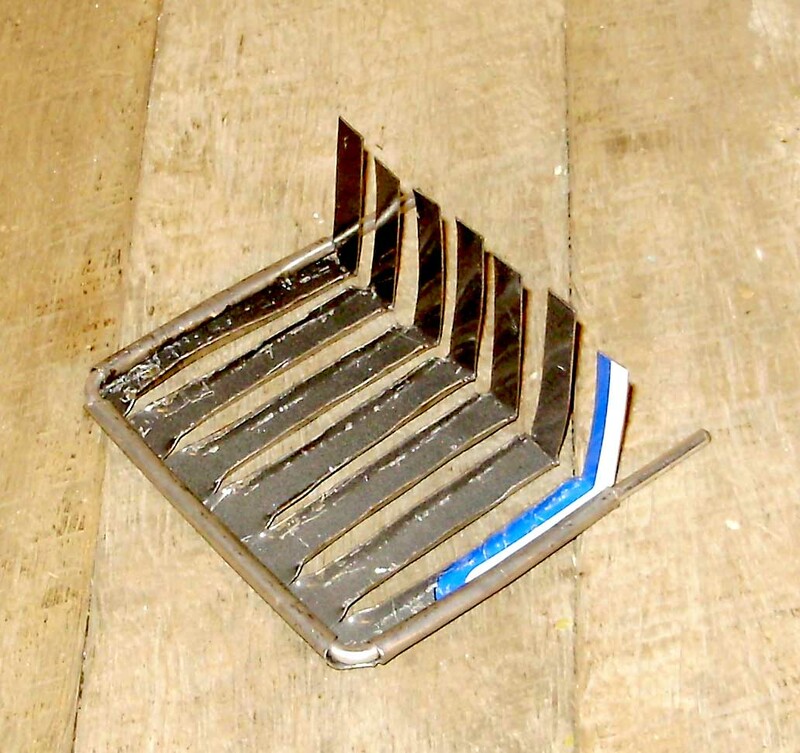 This is the underside of the tuner rack showing the reinforcing wire (coat hanger wire) which is simply forced into a close-fitting hole drilled in the tuner plate/tail piece. This shows the tuner plate which is cut from a piece of reclaimed timber; as is all the timber in these instruments. The weathering on the piece was so nice that I just cleaned it up with a wire brush and finished it with a wax polish. The tuner/bottle neck is also shown here. When it's not being used to play with, it lives in the hole in the top of the neck. This is the spine by itself. Here's the serial number and neck joint. 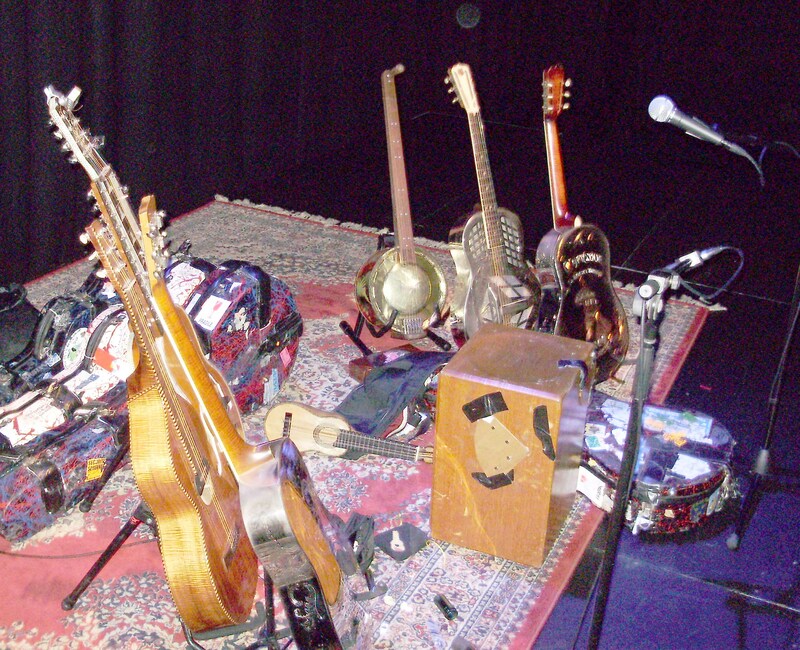 ...and here it is on stage in fine company with Bob's travelling kit set up on stage at the Judith Wright Centre. This is a recording of the piece he played at the concert with his introduction. DoctorOakroot.com - Rough-edged songs on quirky homemade guitars. 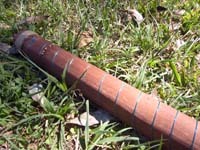 Here is the neck of the Pandulcia demonstrating the happy fact that the strings don't all need to begin at the same fret. 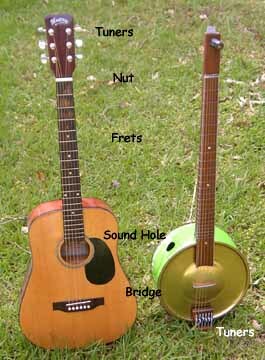 Indeed, instruments can be made with more than one "nut" possibility for each string. 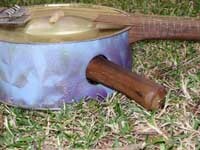 In this case, you can have one instrument with several different stringing arrangements or you can use different lengths of strings according to what's available. 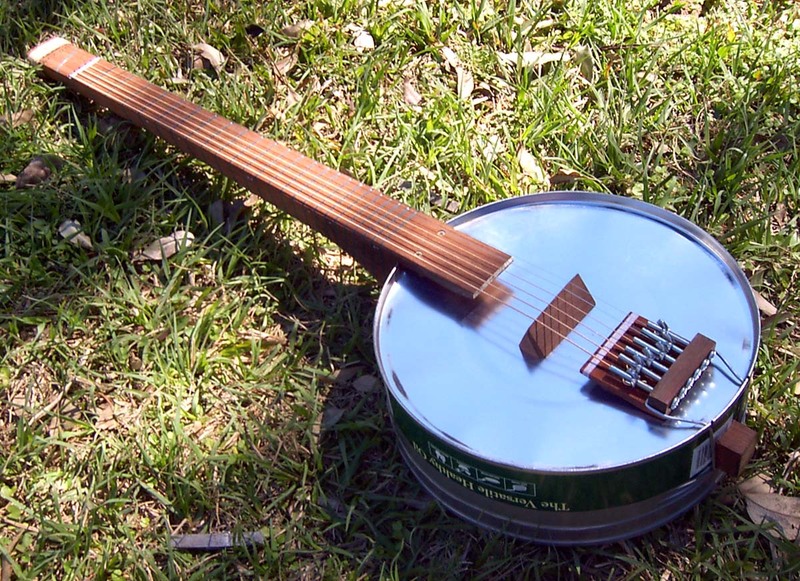 There are several programmes collecting used strings for poor musicians and as they are often shorter than new ones; an instrument can be made to use either new or recycled strings with the simple addition of another row of holes further down the neck. This instrument, Wade calls the Junkyard Dog; it's a 5 string CBG with an old numberplate as the resonator and I'm sure you'll agree it looks quite fine. 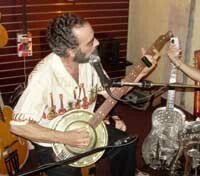 The frets are wire wrapped 'round the neck in the Uncle Bob style. It's good to see the ideas spreading. 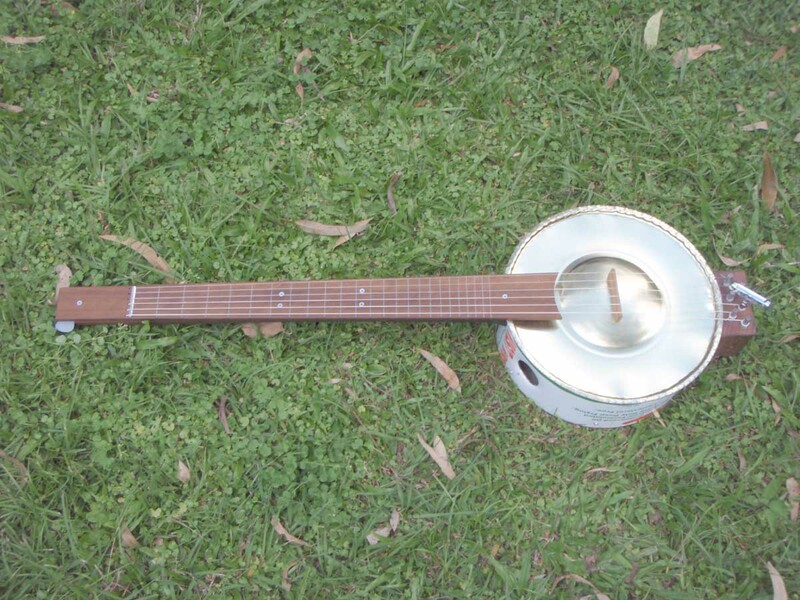 Here's a ukulele I finished just before the Brisbane Guitar Show. The stings are fishing line; 100lb, 60lb and 2 x 40lb. 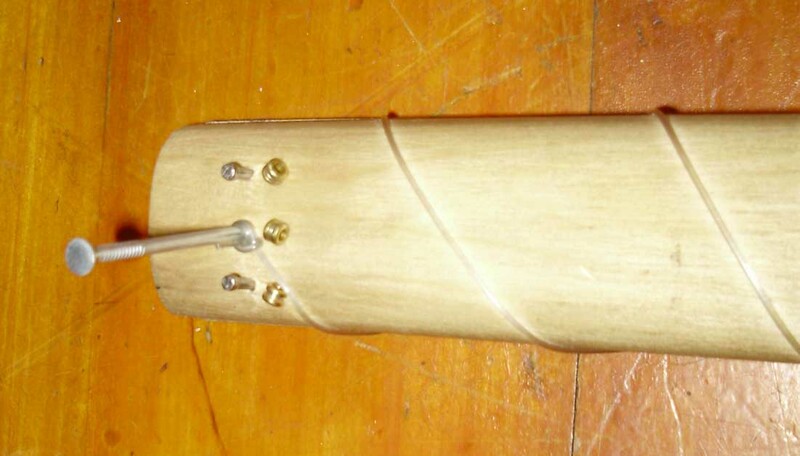 The tuners are bolts and the bridge is seasoned pine of very simple design. 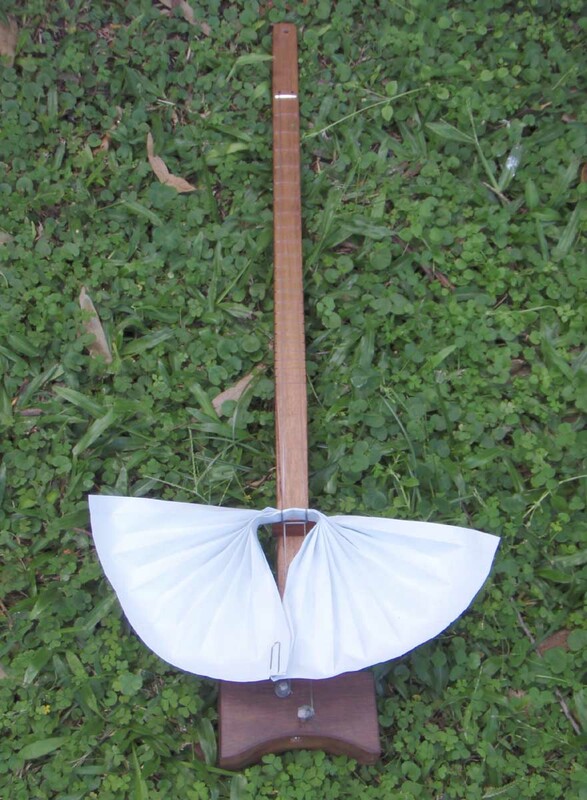 The body dome is formed with an oily broom handle burnisher over a donut shaped form. 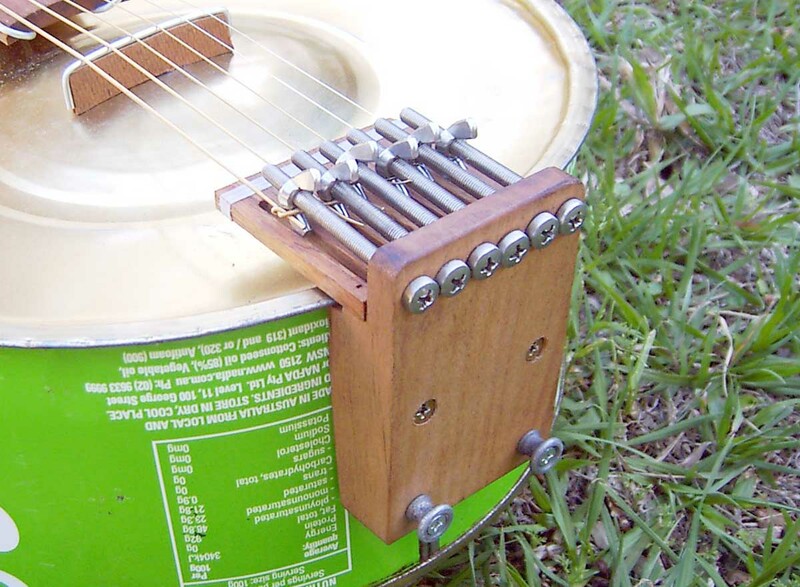 The strings are terminated on nails, the frets on screws. There are nail holes in the timber from it's previous use as a roof truss. 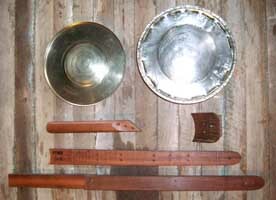 The body tin is one I've had hanging 'round the workshop for a while. 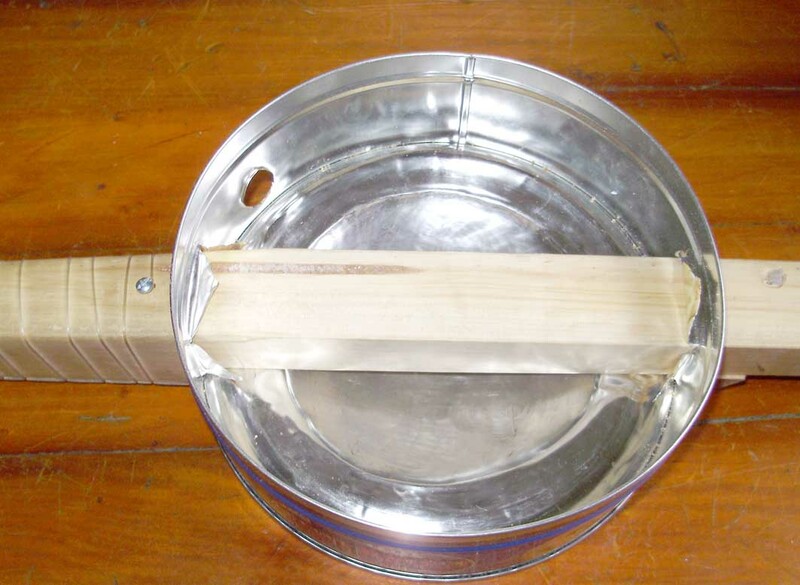 I'm glad it turned into a nice instrument. 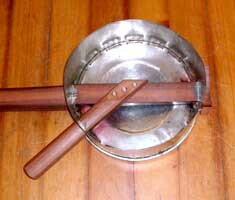 This is a lap fiddle. 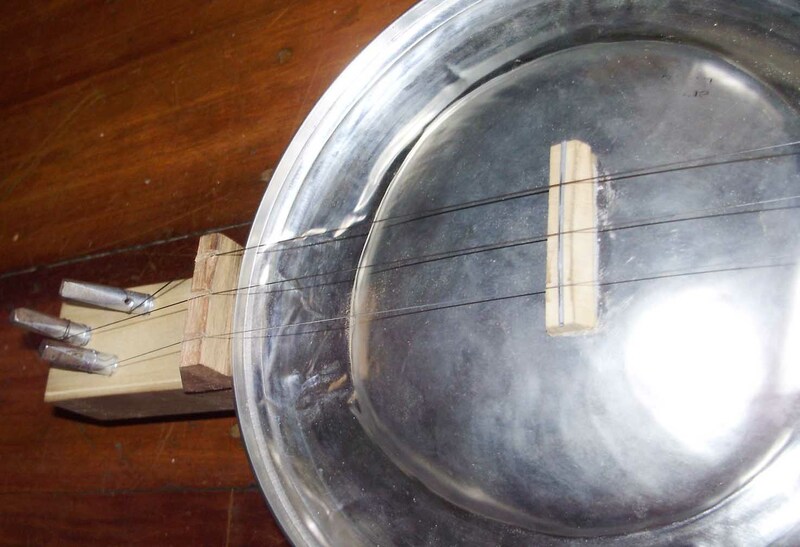 It has two strings tuned a fifth apart in D and A made of fishing line and a resonator made from a single piece of A4 paper. 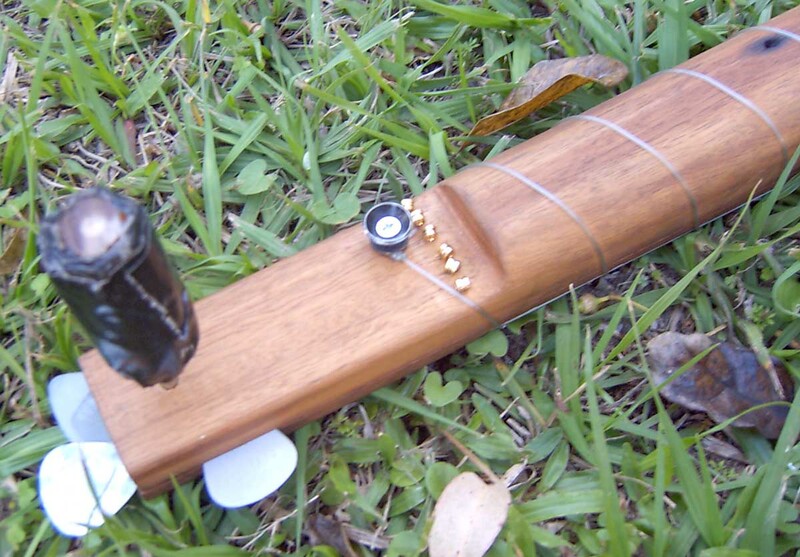 The purpose of the instrument will be to supply a string section for a community orchestra I'm planning in Brisbane. 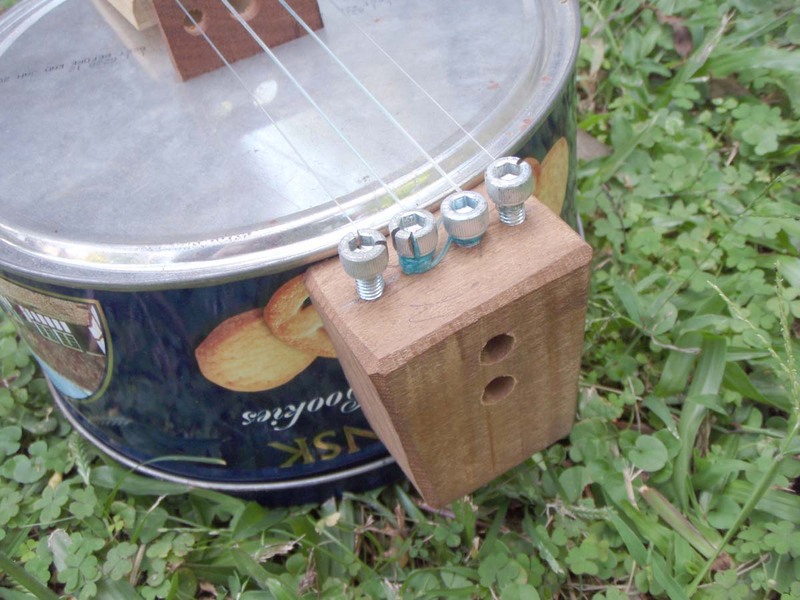 The bridge is a very simple design with the resonator held by a wire clip. A polystyrene coffee cup works as well but doesn't look as nice. 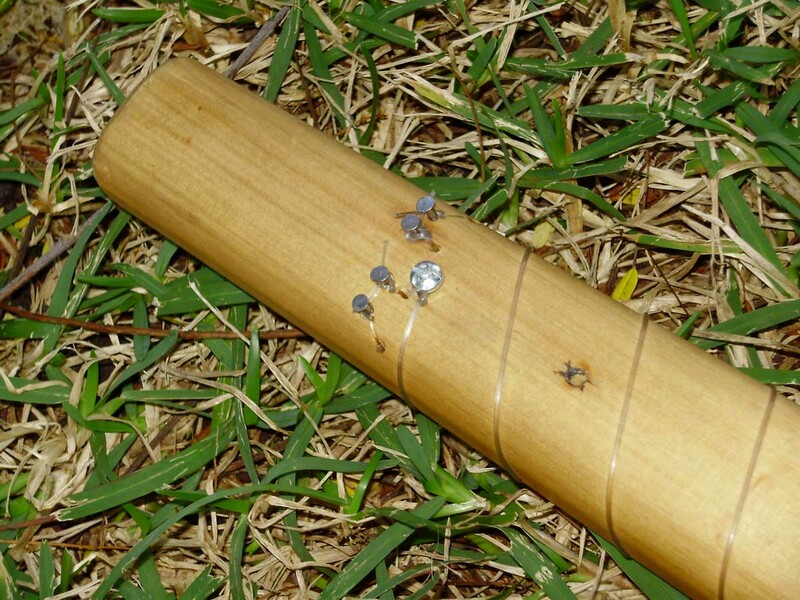 The strings are terminated on nails and the frets are held with screws at each end. 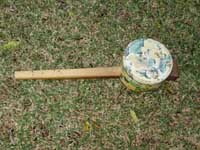 The tuners are bolts with their heads cut off and shaped to suit a drum key. The Bow is a single piece of hardwood strung with nylon sewing thread and loaded with standard rosin. 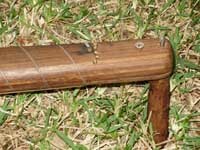 I'll do some recordings of this instrument if anyone shows any interest in the short term. 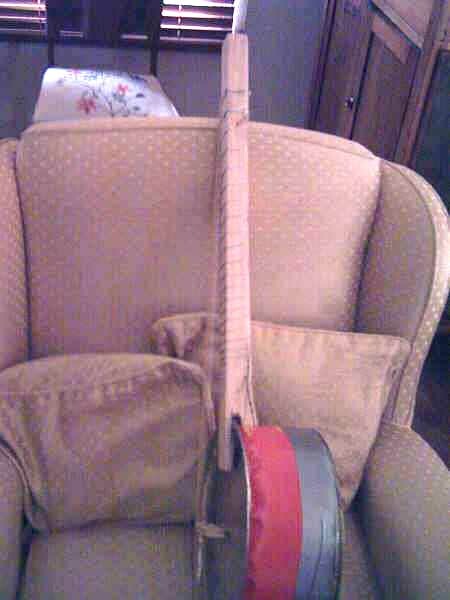 This is my first commisioned instrument; the "Neville" guitar for Mic Conway. 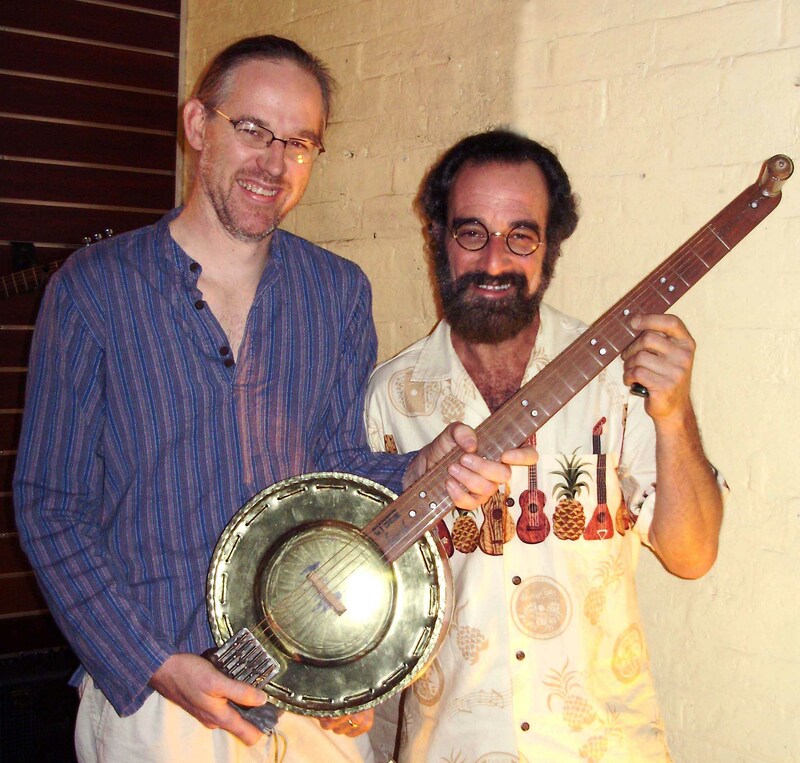 I ran into Mic at Woodford Folk Festival in 2007 when I was releasing the first prototypes. 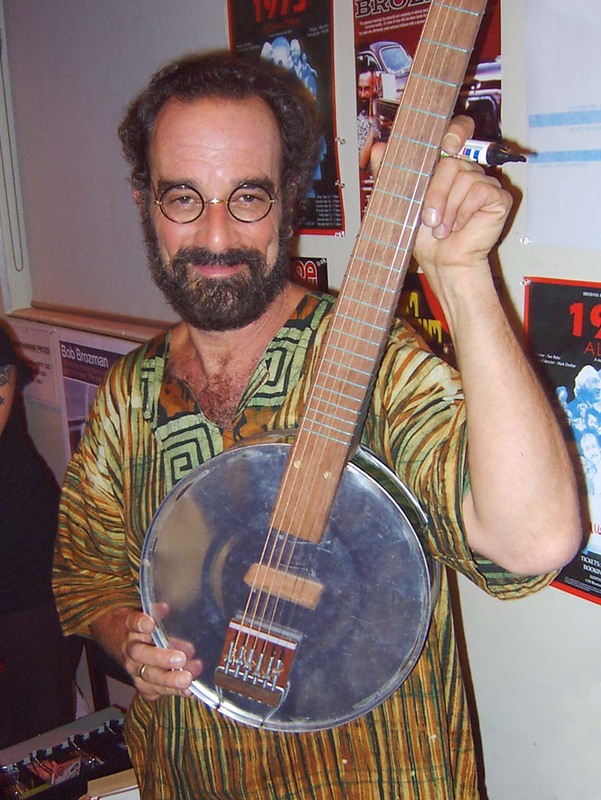 I said, "You don't know me, but you're Mic Conway and you're interested in this guitar." He said, "Yes I am and ... yes I am!" He commissioned his own instrument there and then. It's a four string left handed "tenor" guitar, full 640mm scale length. 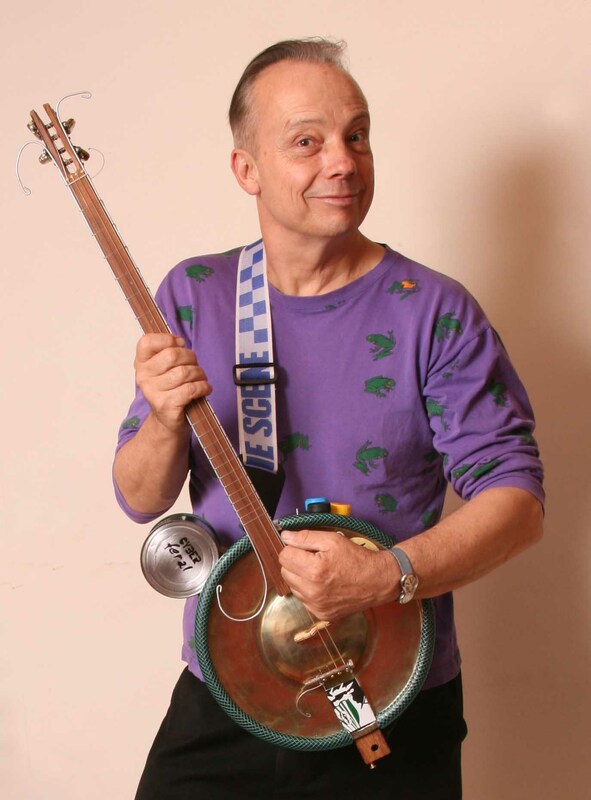 Mic is using it in his National Junk Band and in some shows he does on recycling in schools so he wanted it to look "junky". The tuners are standard machine tuners which have been modified slightly... 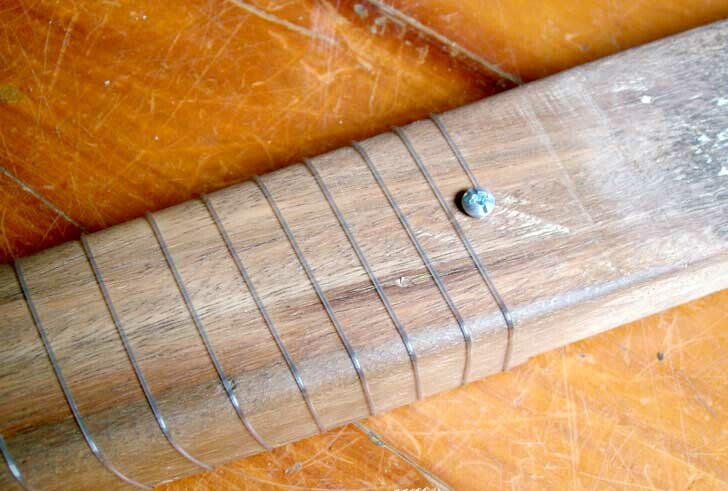 The fret board binding extends both ends of the fret board in an "artistic" manner. 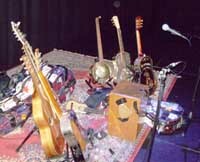 The instrument is fitted with the same pickup system as "007" with knobs made from drink bottle caps. The "nylex" body binding adds extra comfort and junkiness. The coffee can leg rest was originally intended to be a battery container before I discovered I could get the electronics to work without batteries. The dot markers on this are gum sticks looking a bit like knots in the wood. 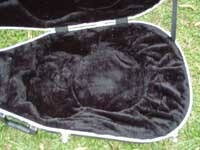 The case is a standard dreadnought acoustic moulded case. 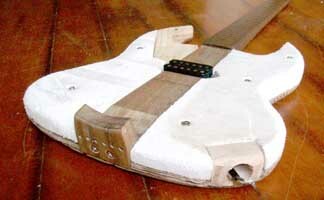 I modified the internal polystyrene padding to suit and the guitar fits beautifully. Here's the proud owner. Thanks very much Mic.. This is my first attempt to make a guitar specifically for http://www.bobbrozman.com. When I showed him the prototypes at Woodford 07 his only criticism was that they should be 20% louder. 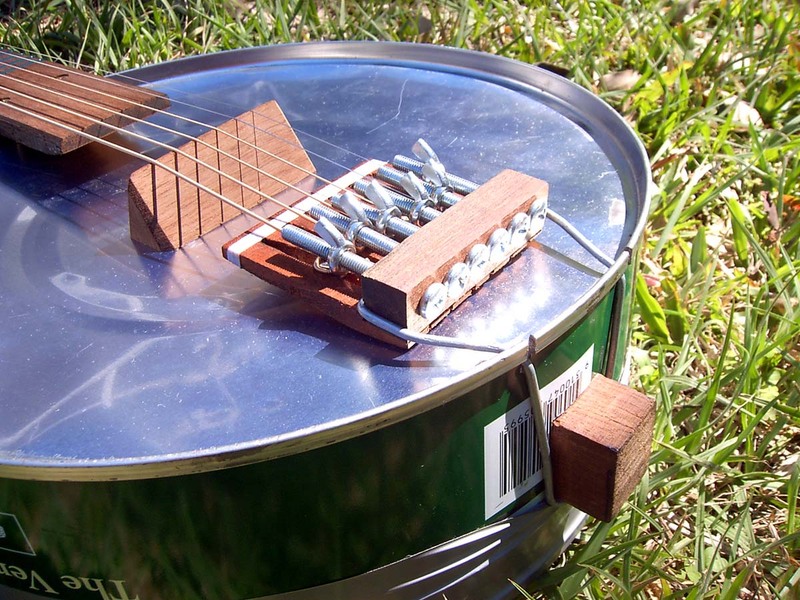 I've also installed a pickup system into this guitar using Piezo disk elements like those used as speakers in those annoying Christmas cards that play carols. I managed to come up with an arrangement of electronics that sounds good through a normal amp and does not require a battery. 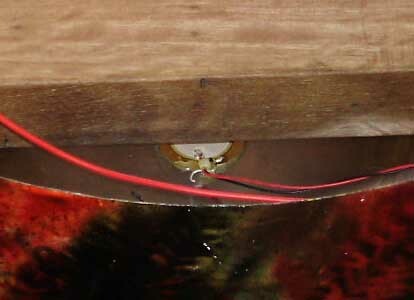 Here you can see the pickup glued to the soundboard directly below the bridge. This shows the seperate fret board similar to 006 and also shows the crimping of the back piece. The back is held in place just by the tightness of the fit. I really like the dot markers on this one; screws on the face and gum twigs glued into the edge. This is the classical version of the guitar. Same scale length but wider neck and standard high tension classical strings. 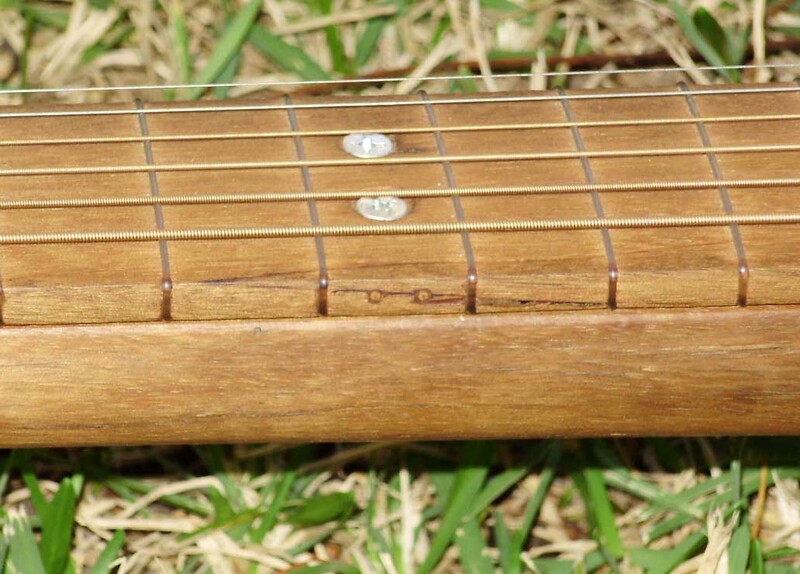 The fret board is a seperate piece of wood. Since the fret board is so wide, I had trouble getting a piece big enough for the spine. 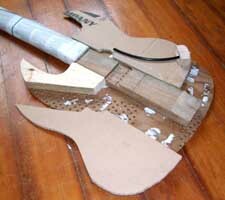 I ended up using a 2" by 4" and the back of the neck is narrower than the fret board at the body end. This does not hamper playability in any way though. The back of the neck is free of frets and lovely to play. The system I've used for terminating the strings here is a bit fiddly but looks interesting. 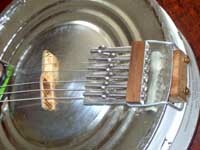 The headstock also has a hole for holding the drum key and accomodates picks between the fretboard and spine. 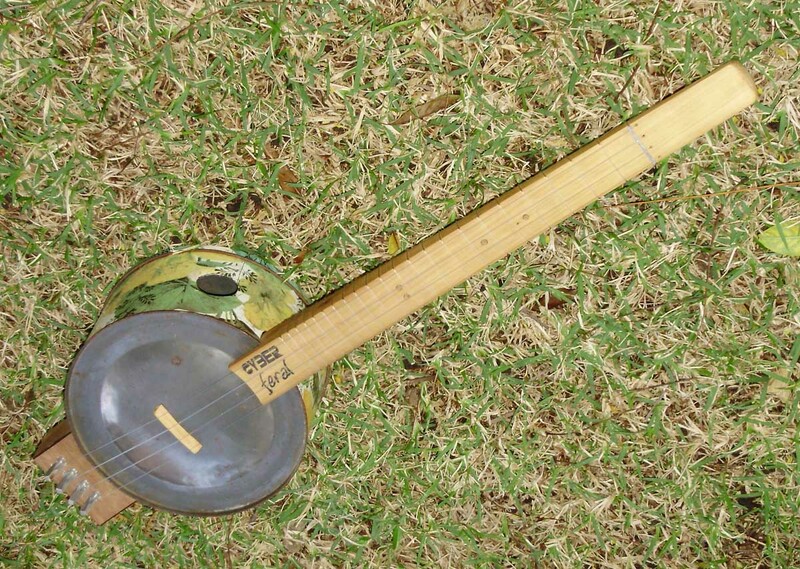 The nylong strings require a different tuner design. The tuning pegs are 8mm bolts with the heads cut off and filed to fit a drum key. 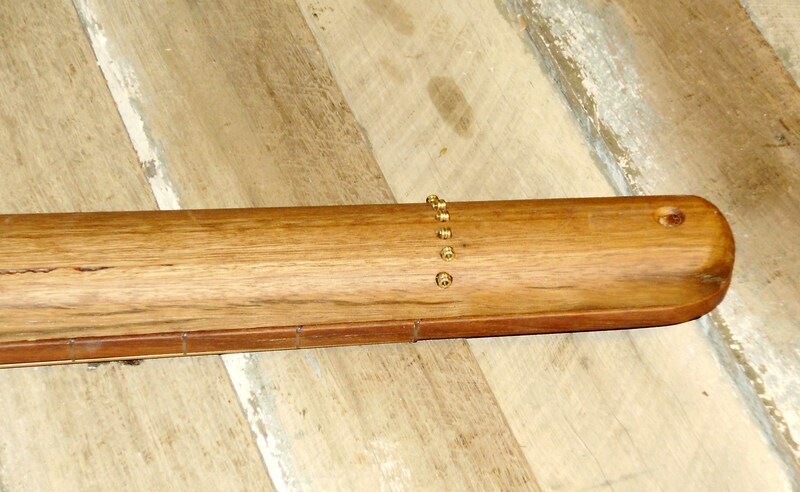 The tuner block is the same hardwood as the spine fitted onto the end of the spine. 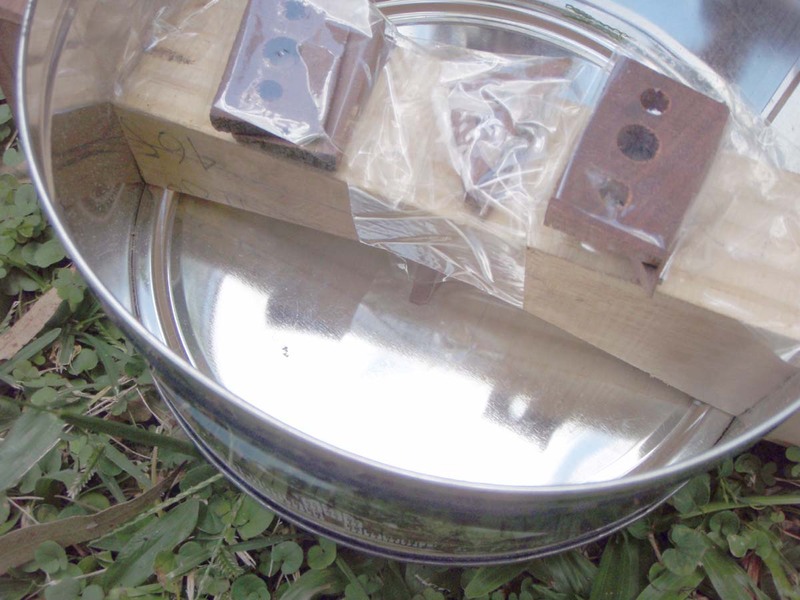 The holes are drilled and taped with a standard tapping tool (a modified bolt works too) and the holes are shimmed with a thin piece of cardboard to maintain the friction. 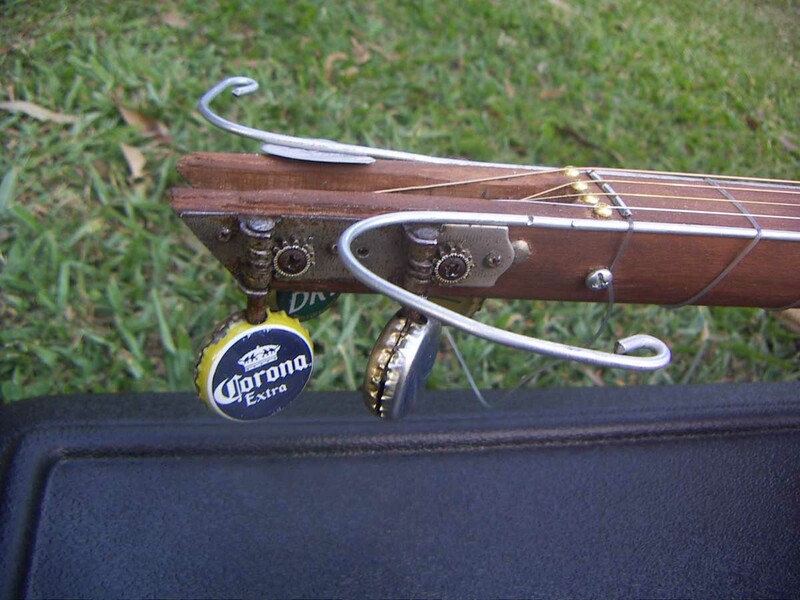 Not as elegant as machine tuners but much easier and cheaper to make and stays perfectly in tune. This one has is the "semi acoustic" model. The pickup is out of an "Epiphone Les Paul". 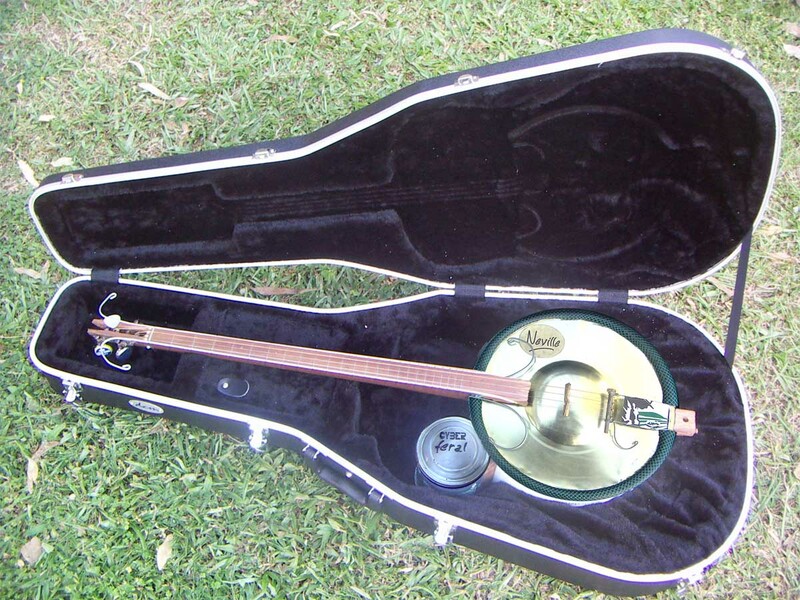 I've taken it out of its brass cover and fitted it to a plate which slips over the end of the neck binding wires. 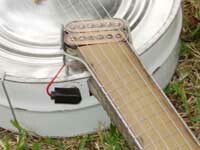 The lead plugs into a socket on the side of the body so that the pickup can be quickly removed from the guitar. 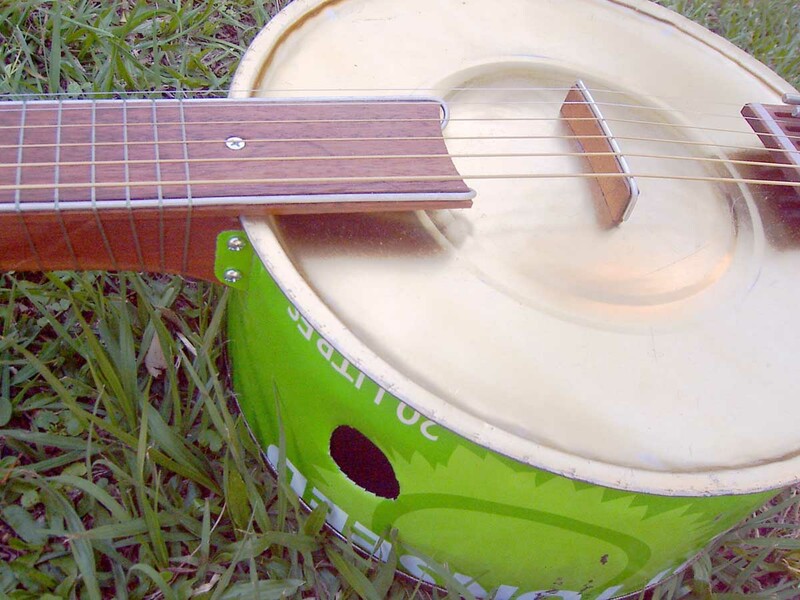 The idea is that the pickup is the only thing worth stealing on the guitar so it can be kept in your pocket if you find yourself sleeping rough. Internally the pickup is wired directly to the output socket without any knobs which no serious rocker uses anyway. The strings are standard .010" to .048" electric strings. The bridge and tuner are effectively the same as on 004. I got the logo done up as a rubber stamp; it looks quite nice on the headstock I think. The wood is finished with a beeswax polish. 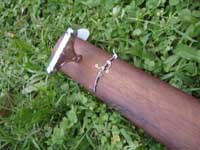 The neck binding is a piece of 2.5mm wire which is notched to position the fishing line frets and holds the pickup on as well. 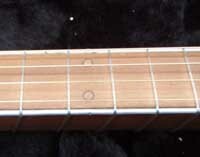 The neck binding is held on by the frets. 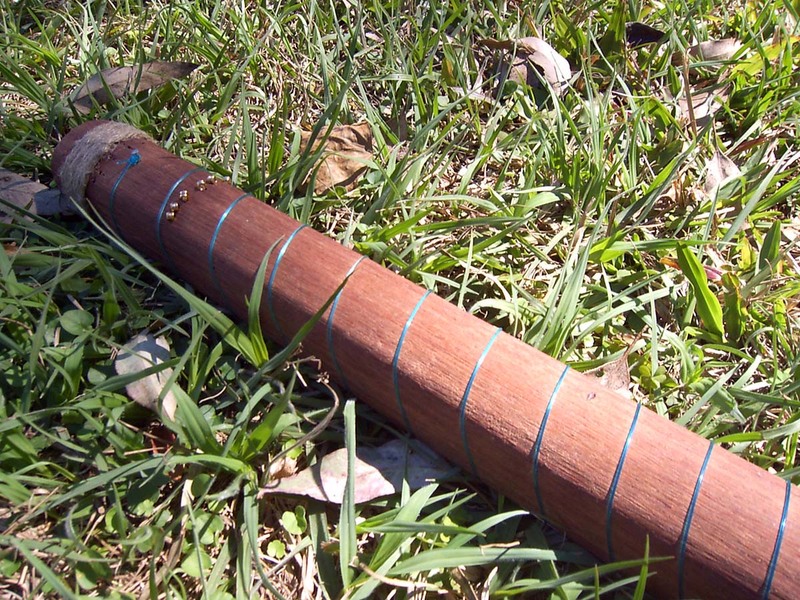 The neck is a single pice of wood and is held firm in the body by the tension of the strings. 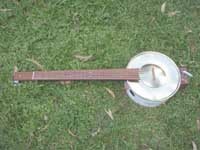 Another full scale standard steel string guitar. The arm on the body acts like the bottom ear of an electric guitar and gives you somewhere to put your knee. 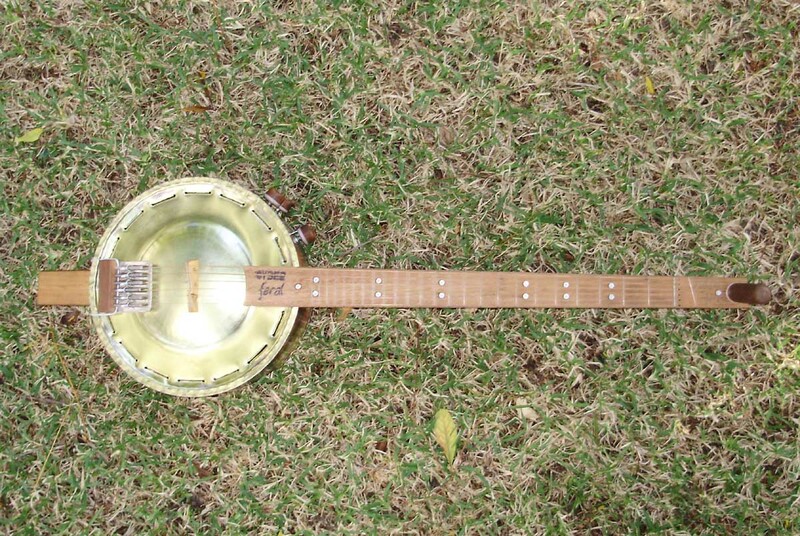 More like a guitar to play than a banjo. 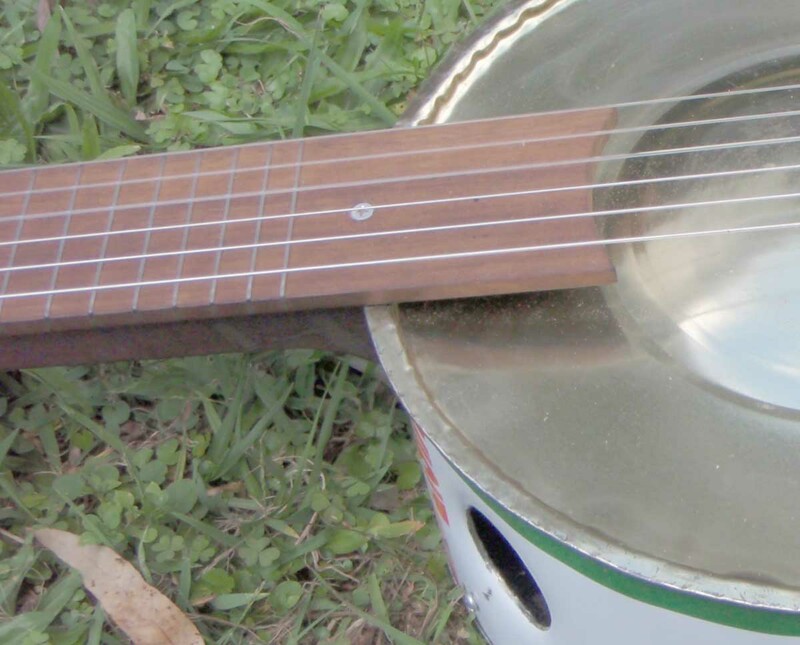 The frets on this are tie wire; galvanised steel about 0.8mm diameter, and are countersunk into the back of the neck to give it a smooth feel. 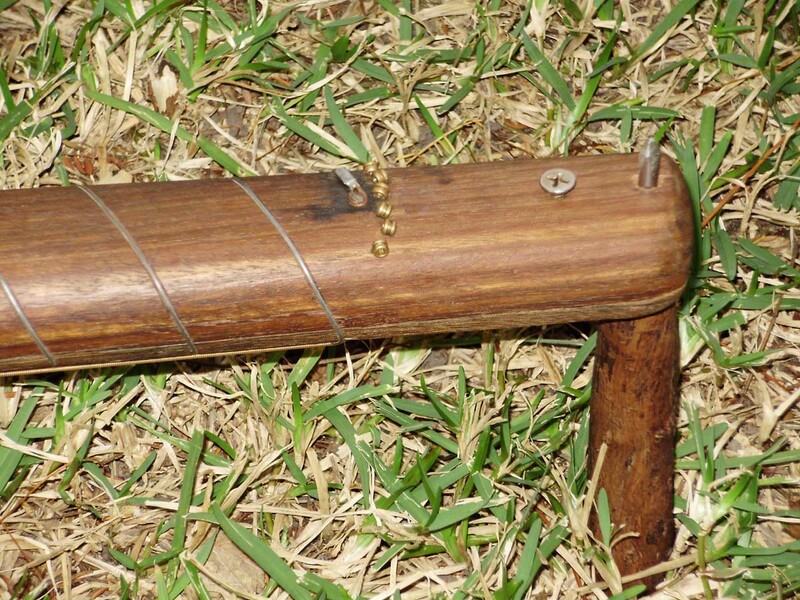 The bridge is seasoned pine with a tie wire contact point. The shape gives intonation compensation so that all the strings are in tune all the way up to the 24th fret. 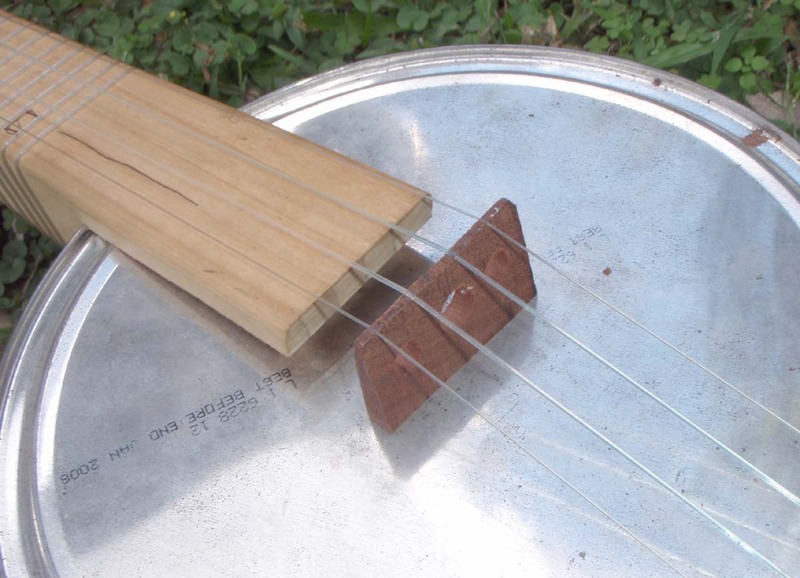 The holes are to reduce the weight of the bridge and improve bass responce. 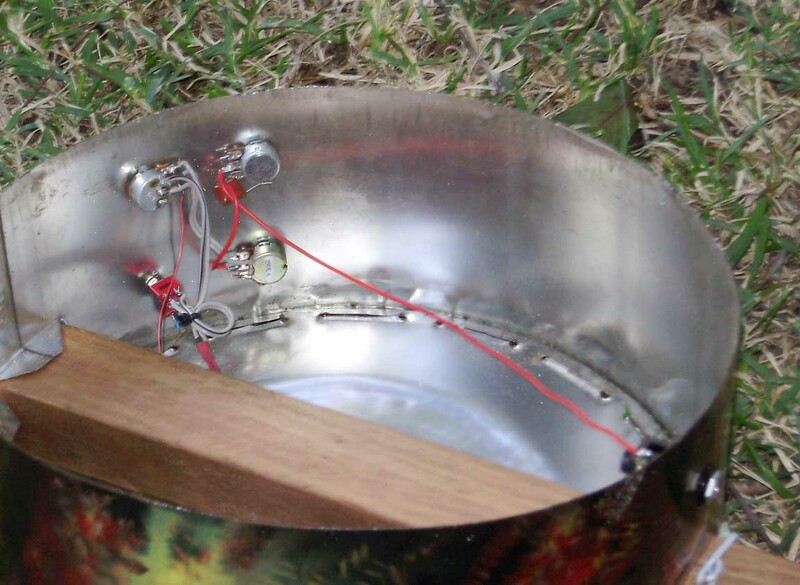 The tuner uses sheet steel left over from the body can for the slot frame and is fixed to the spine protruding from the bass of the body with a piece of 2mm wire. Here you can see the lower horn as it comes out of the body. It is fixed to the spine with two screws. The screw on the end is the strap button. This is 003 (the one on the right). 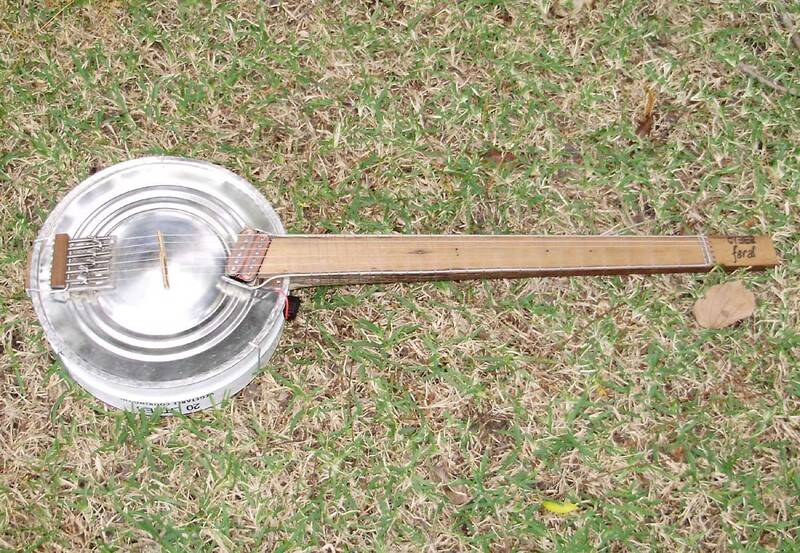 It's a standard steel string guitar. 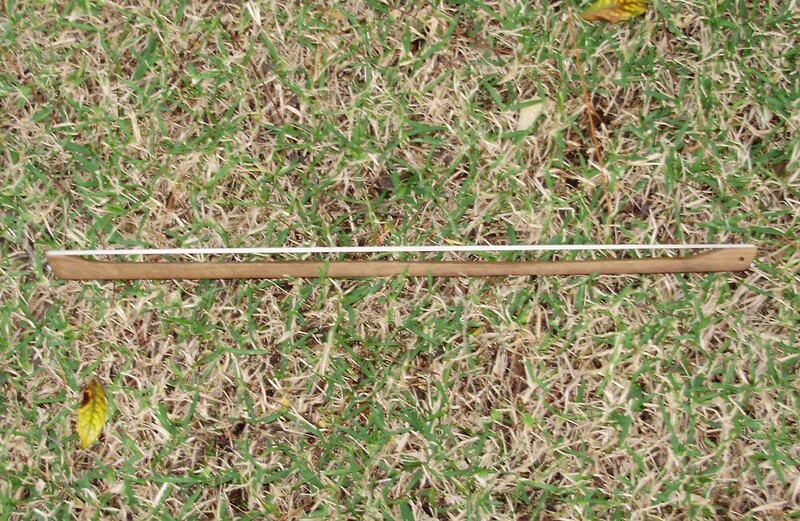 Scale length is 640mm. The body is two bases of 20 litre vegetable oil cans joined together. The dome in the body is formed by hand using an oily broom handle. The bridge is a piece of 6mm Masonite (low density fibre board) with a wire over the top. 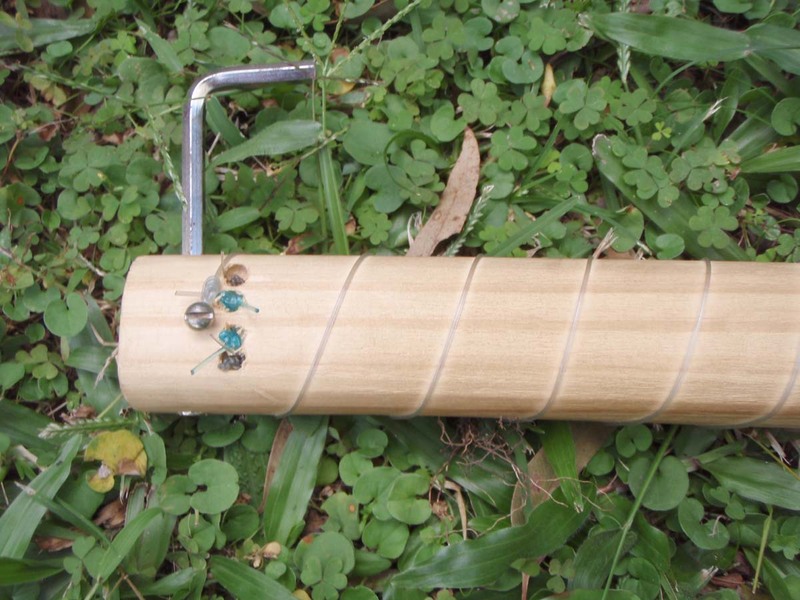 The tuner uses a wooden guide rack and is fixed directly to the spine. 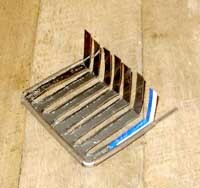 This gives a more solid construction than the wire tailpiece and (I think) improves the energy of the bass strings. It is considerably more work though. The twin strap buttons allow the instrument to stand by itself on a level floor. The screwdriver fits into a hole in the headstock and in this case is used as a handy place to store gaff tape. The neck and fret board are two seperate pieces on this instrument so we have somewhere to store pics and the frets are held on by the strap button. The strings simply thread through holes above the nut. The wood is reclaimed hardwood from a building renovation; I think it's blue gum and has probably been seasoned for 60 years. It's amazing that this sort of wood ends up in skips. You can see a nail hole in the neck. 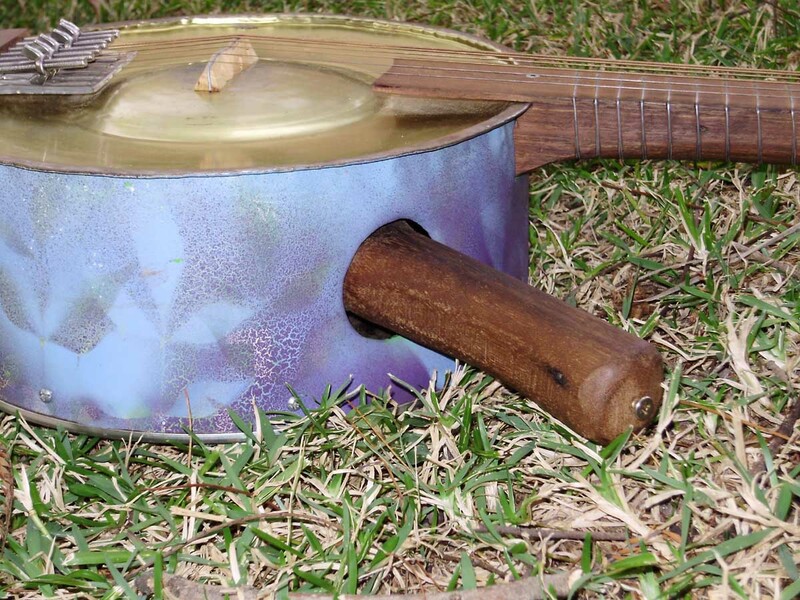 This is a ukulele version of the Uncle Bob. 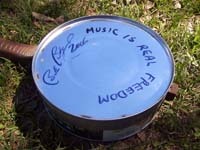 It was made for Christmas 2006 and belongs to Elliot Neville; the inventors daughter. The strings are fishing line; 100lb, 60lb and 40lb. The scale length is approx 480mm. The neck is an offcut of pine wall stud from a building site. The bride is hardwood. The body is a shortbread biscuit tin left flat. Inside the body we can see how the bridge is supported. Taped to the spine are some spare bridges and bridge supports (the triangular pieces). 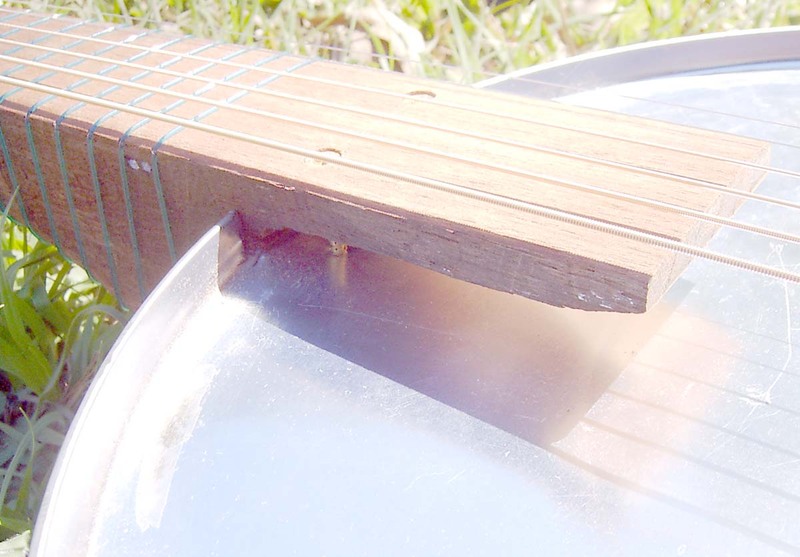 The edge of the support can be seen between the spine and the "sound board" the bridge is on the other side. 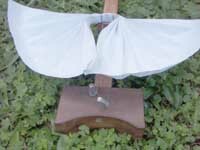 This style of bridge support gives rock solid action and is very easy to make but is fairly quiet. The nylon strings require a different tuner since they need to be stretched quite a bit to come up to pitch. 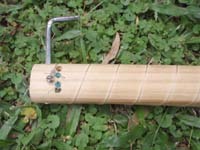 Here I've used cup head bolts threaded into a hardwood block which is fixed into the end of the spine with two screws. The holes are threaded with a modified bolt and friction is controlled by adding thin strips of thin cardboard into the hole alongside the bolt. The frets are 60lb fishing line wrapped around the one piece neck. The strings are terminated with large knots and the headstock provides a storage for the tuning allen key which also acts as a hanging hook. 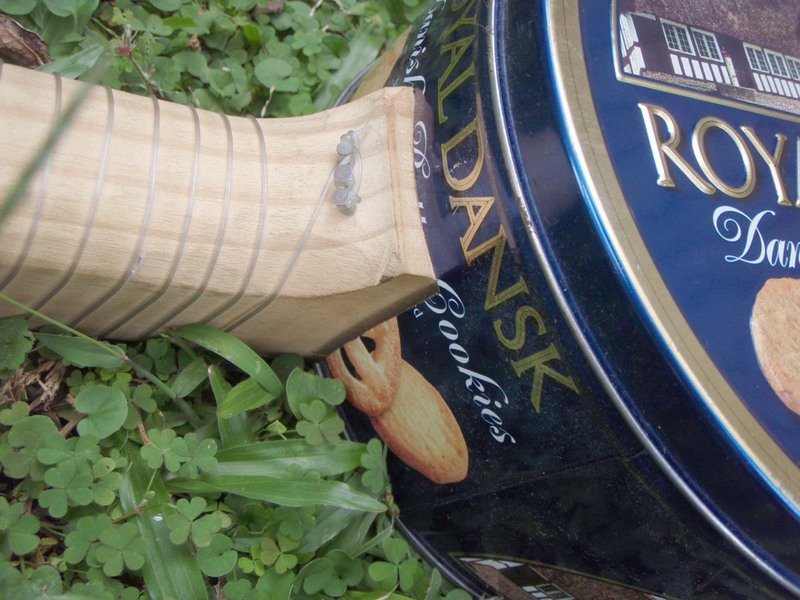 The neck joint is a simple cutout, done in this case with a small electric cutting wheel. This is sample of what it sounds like. 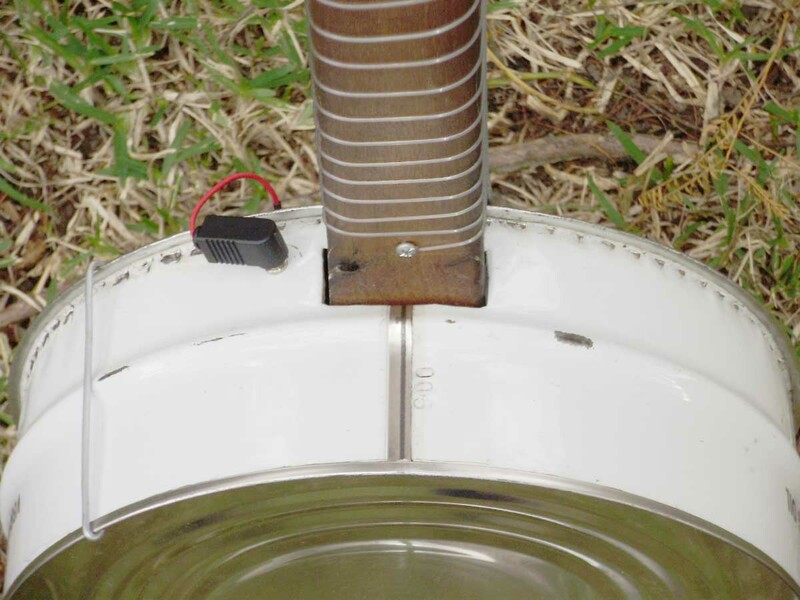 This is the first "proof of concept" instrument. It has 6 strings; .012" to .052" phosphore bronze "steel" strings. Scale length is 640mm. 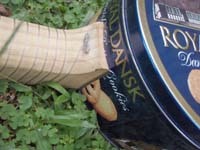 The frets are nylon (100lb fishing line) wrapped around the whole neck. 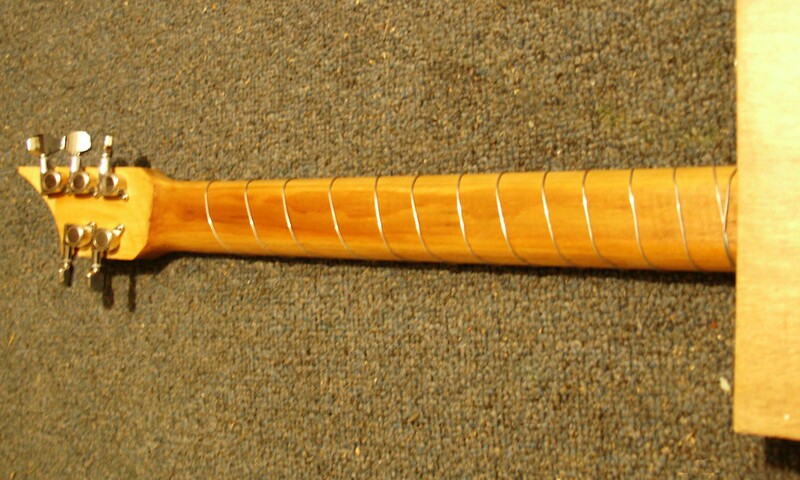 The neck is seasoned hardwood recovered from a building renovation. 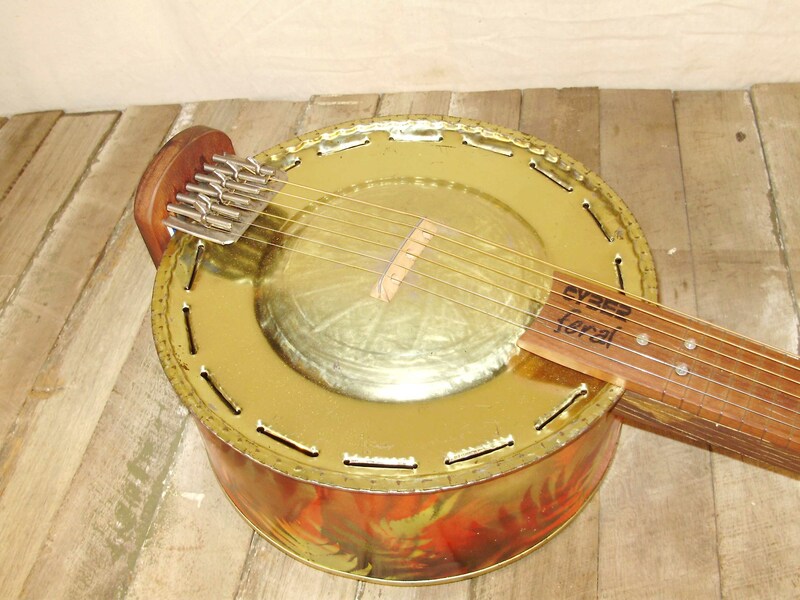 The tuner uses a wooden slot base and a heavy wire tailpiece. The bolts are M5 x 65mm stainless steel. 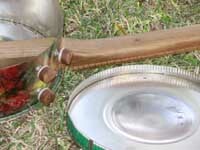 The body is a 20l "chip oil" can donated by a chip shop in Maleny and is used flat here. The pressure of the strings on the flat belly causes distortion in the shape of the tin and the action is quite unstable. 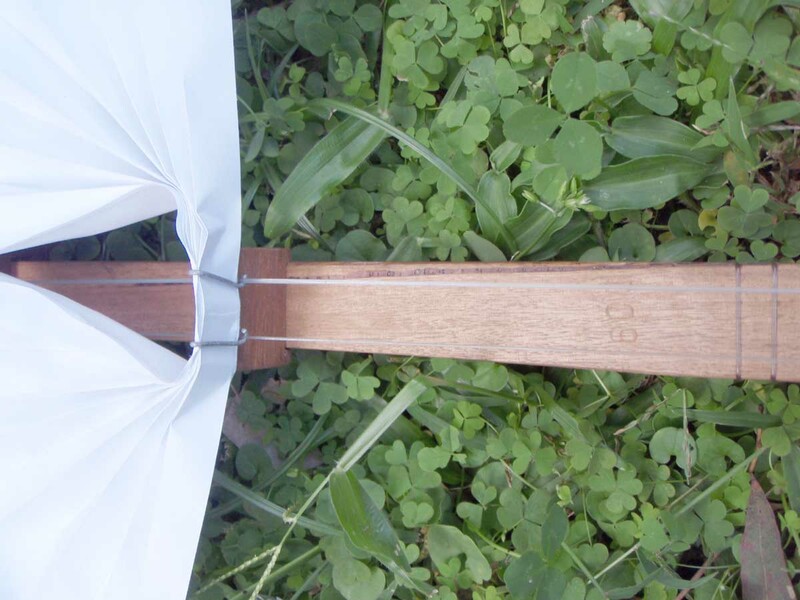 The bridge is hardwood and of very basic design. 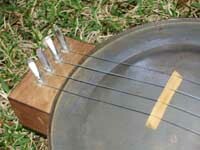 The neck join is via a section cut out of the rim, two screws holding the "sound board" are visible here. 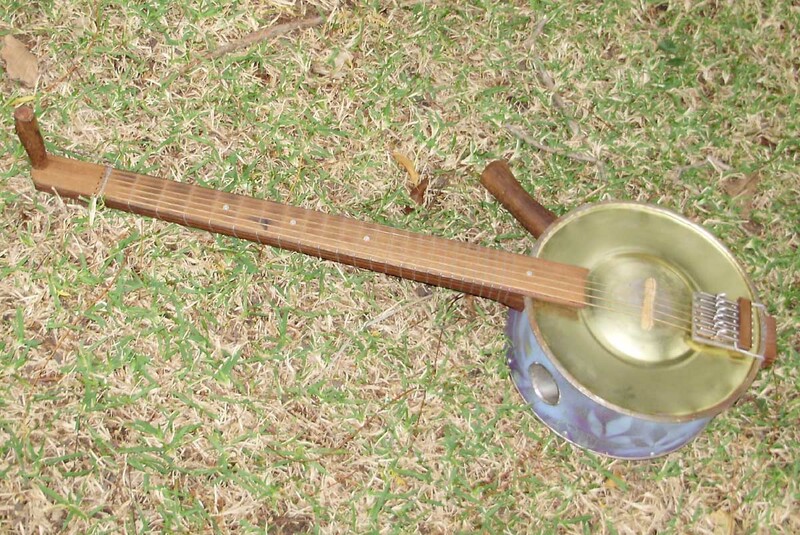 The back of the body is also flat on this instrument. The inscription is by Bob Brozman. Here's Bob on the 7th of September 2006 at the Judith Wright Centre in Brisbane Queensland.